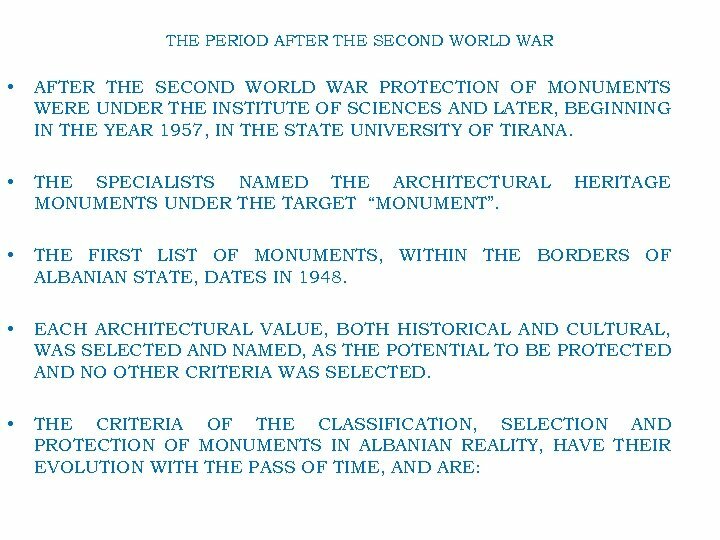 RESTORATION OF ARCHITECTURAL MONUMENTS ALBANIAN LEGISLATION ON THEIR NOMINATION, PROTECTION AND VALUATION Lida MIRAJ, 2011 • Nomination, Protection and Valuation of Cultural Monuments in Albania, as Historical and Cultural Testimonies, dates in the first half of Twentieth Century. • With the independence of Albania after five centuries of Ottoman occupation, in 28 of November, 1912 the difficult political situation in the country was not stabilized, although the creation of an Albanian nation was acknowledged by the “Ambassadors’ Conference” in London on December 20 of the same year. • The Peace Treaty of London at the end of the First Balkan War (The First Balkan War began on October 8, 1912) had left the status of Albania and the Aegean Islands to the decision of the great powers. • The Second Balkan War began on night of June 29/30, 1913, when King Ferdinand of Bulgaria ordered his troops to attack Serbian and Greek forces in Macedonia. • The Conference of London, led by the British Minister of Foreign Affairs, Sir Edward Grey, with the participation of the United Kingdom, Austria-Hungary, Germany, Italy, France, and Russia, was held on July 29, 1913, decided to reduce borders of Albanian state, to create “an independent sovereign Principality, ” where the powers should guarantee her neutrality. • • The Albanian boundaries were announced at Florence in December 1913. It left many Albanians south of the border and other Albanian-speakers were left in Montenegro and Serbia. In November 1913 the Great Powers had arranged that it should have a new monarch, the German protestant, Prince Wilhelm of Weid, as the ruler of the new state. The World War I (1914 -1918) and the continuing insurrections, however, created further attempts at direct intervention and partition by Greece, Austria and Italy. Italians under the pretext of the “dangerous” situation created in Vlora by a Greek army, that occupied South Albania, assumed control of the region. 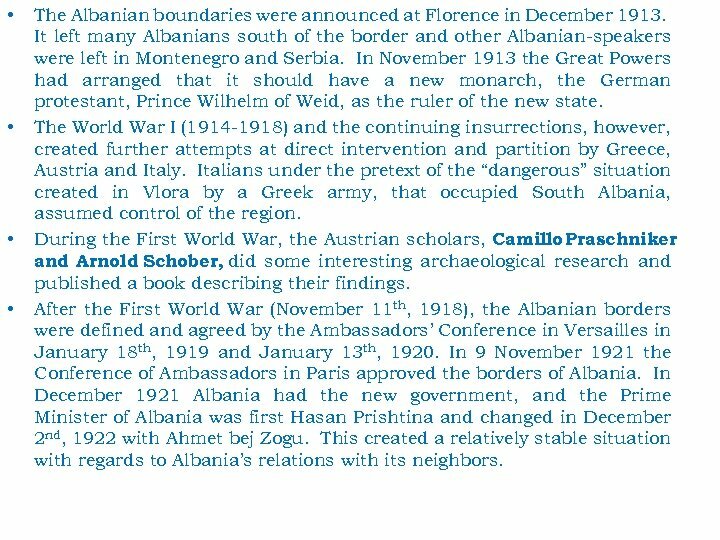 During the First World War, the Austrian scholars, Camillo Praschniker and Arnold Schober, did some interesting archaeological research and published a book describing their findings. After the First World War (November 11 th, 1918), the Albanian borders were defined and agreed by the Ambassadors’ Conference in Versailles in January 18 th, 1919 and January 13 th, 1920. In 9 November 1921 the Conference of Ambassadors in Paris approved the borders of Albania. In December 1921 Albania had the new government, and the Prime Minister of Albania was first Hasan Prishtina and changed in December 2 nd, 1922 with Ahmet bej Zogu. This created a relatively stable situation with regards to Albania’s relations with its neighbors. 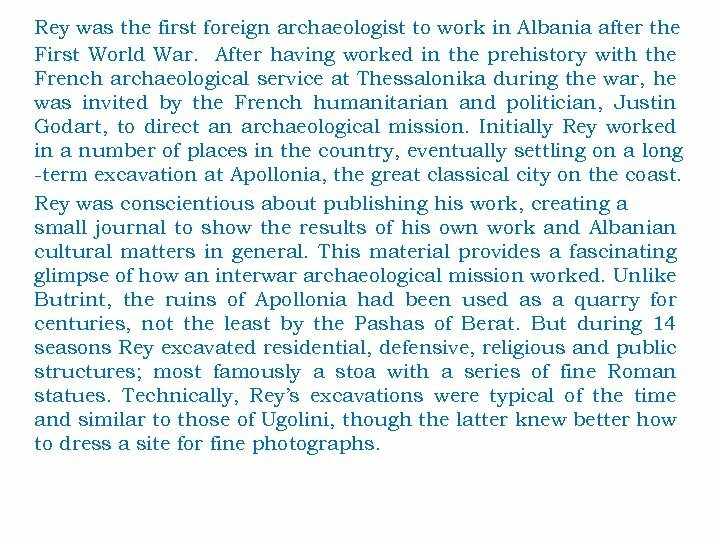 Rey was the first foreign archaeologist to work in Albania after the First World War. 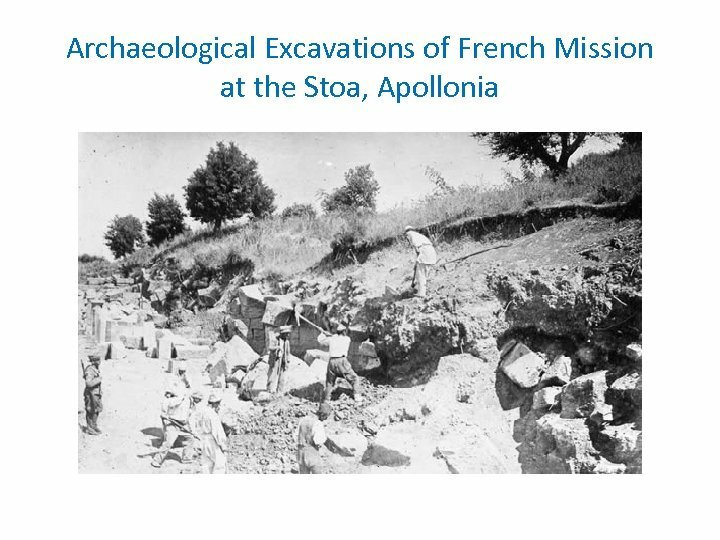 After having worked in the prehistory with the French archaeological service at Thessalonika during the war, he was invited by the French humanitarian and politician, Justin Godart, to direct an archaeological mission. Initially Rey worked in a number of places in the country, eventually settling on a long -term excavation at Apollonia, the great classical city on the coast. Rey was conscientious about publishing his work, creating a small journal to show the results of his own work and Albanian cultural matters in general. 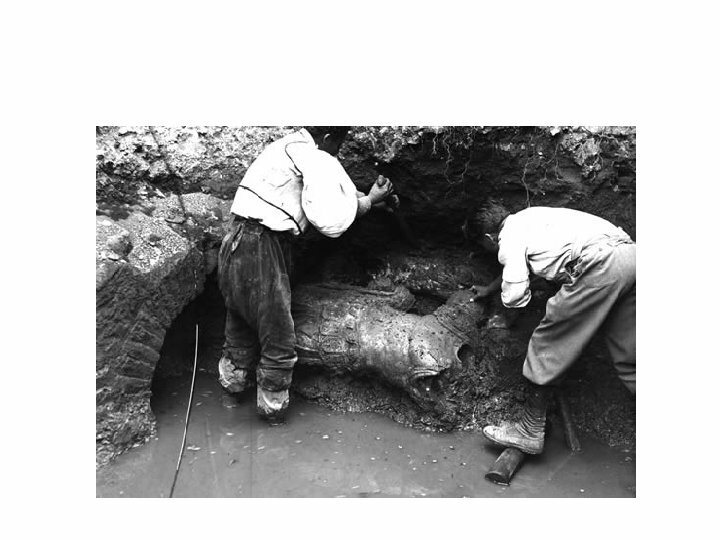 This material provides a fascinating glimpse of how an interwar archaeological mission worked. 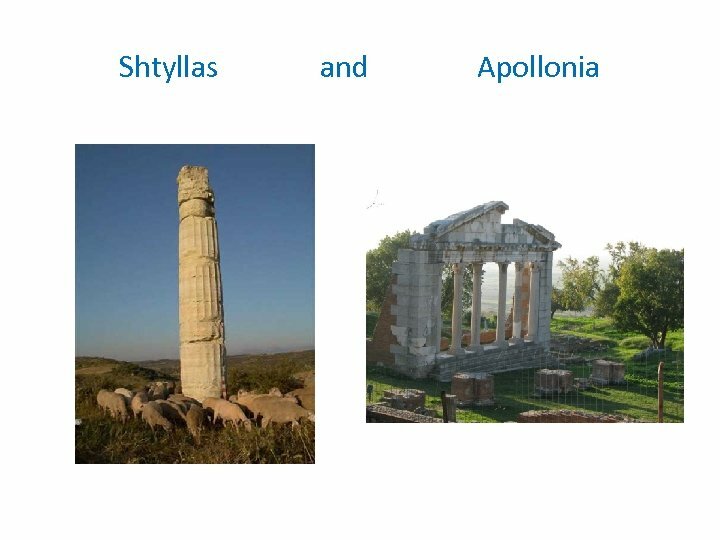 Unlike Butrint, the ruins of Apollonia had been used as a quarry for centuries, not the least by the Pashas of Berat. But during 14 seasons Rey excavated residential, defensive, religious and public structures; most famously a stoa with a series of fine Roman statues. 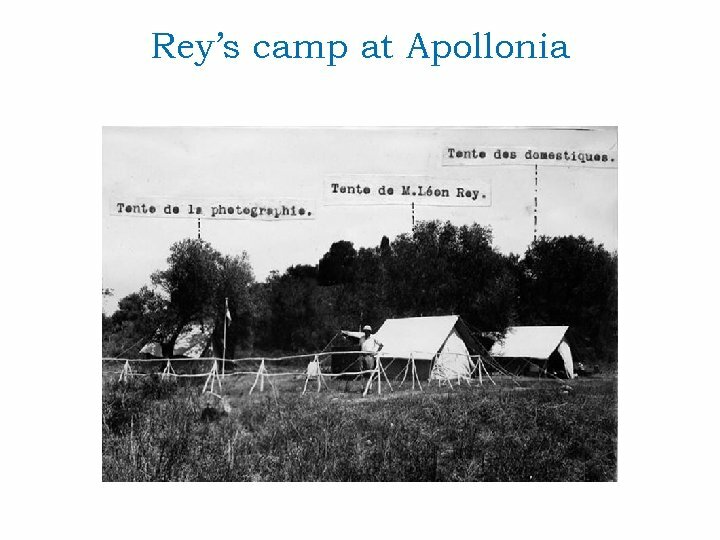 Technically, Rey’s excavations were typical of the time and similar to those of Ugolini, though the latter knew better how to dress a site for fine photographs. 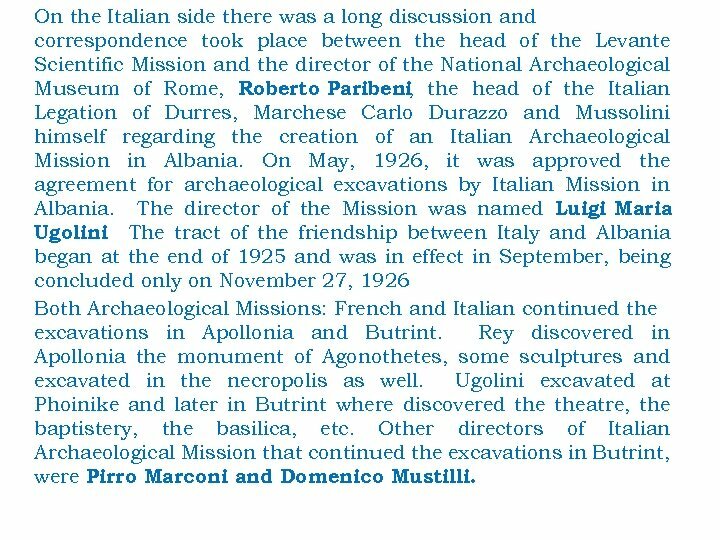 On the Italian side there was a long discussion and correspondence took place between the head of the Levante Scientific Mission and the director of the National Archaeological Museum of Rome, Roberto Paribeni the head of the Italian , Legation of Durres, Marchese Carlo Durazzo and Mussolini himself regarding the creation of an Italian Archaeological Mission in Albania. 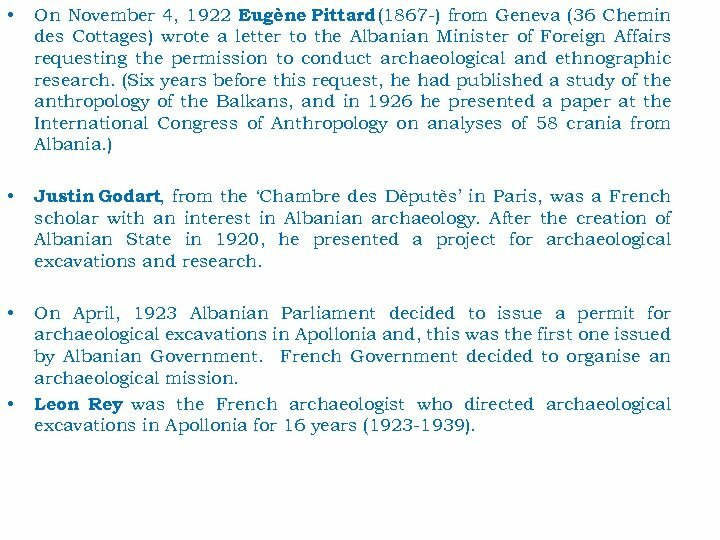 On May, 1926, it was approved the agreement for archaeological excavations by Italian Mission in Albania. The director of the Mission was named Luigi Maria Ugolini The tract of the friendship between Italy and Albania. 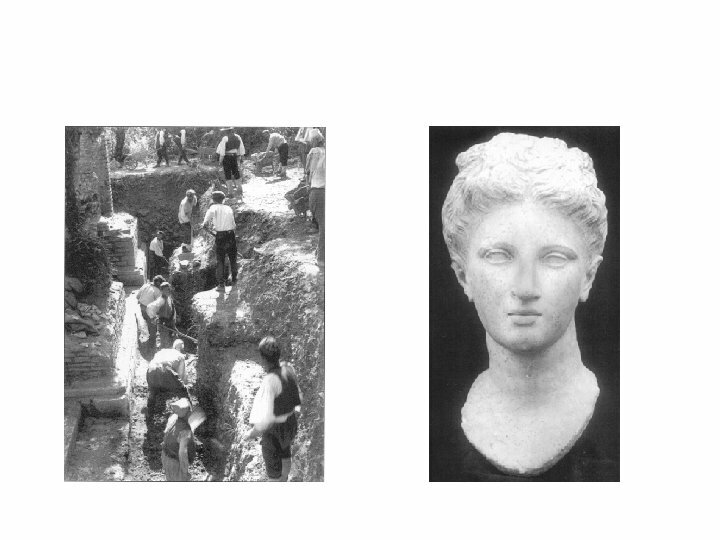 began at the end of 1925 and was in effect in September, being concluded only on November 27, 1926 Both Archaeological Missions: French and Italian continued the excavations in Apollonia and Butrint. Rey discovered in Apollonia the monument of Agonothetes, some sculptures and excavated in the necropolis as well. 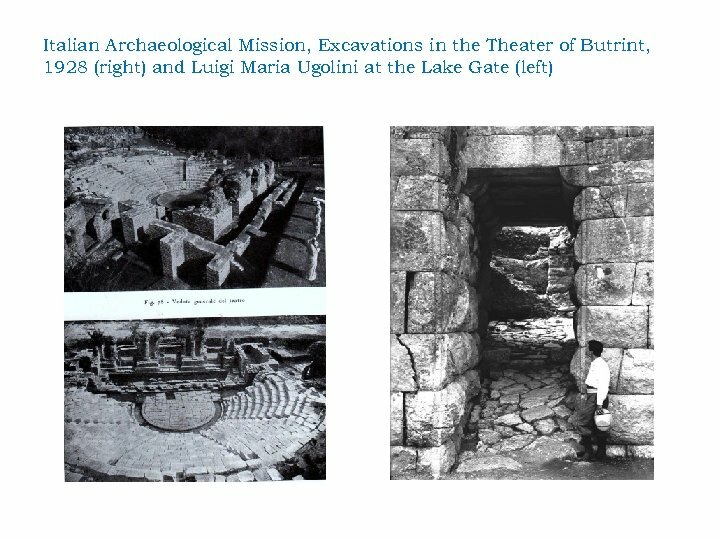 Ugolini excavated at Phoinike and later in Butrint where discovered theatre, the baptistery, the basilica, etc. 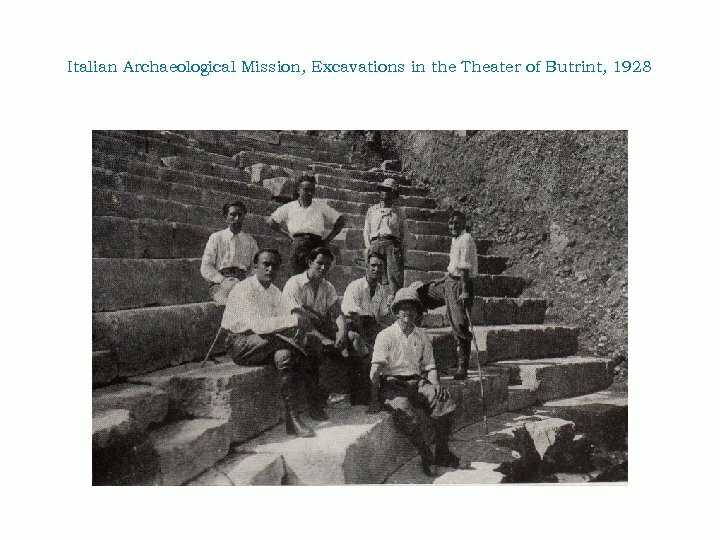 Other directors of Italian Archaeological Mission that continued the excavations in Butrint, were Pirro Marconi and Domenico Mustilli. • Beginning on April 7, 1939, with the first day of the Italian invasion, Albania was involved in the Second World War. In the same day Zogu left Albania and went to London. On April 8 Tirana was occupied from Italian army. 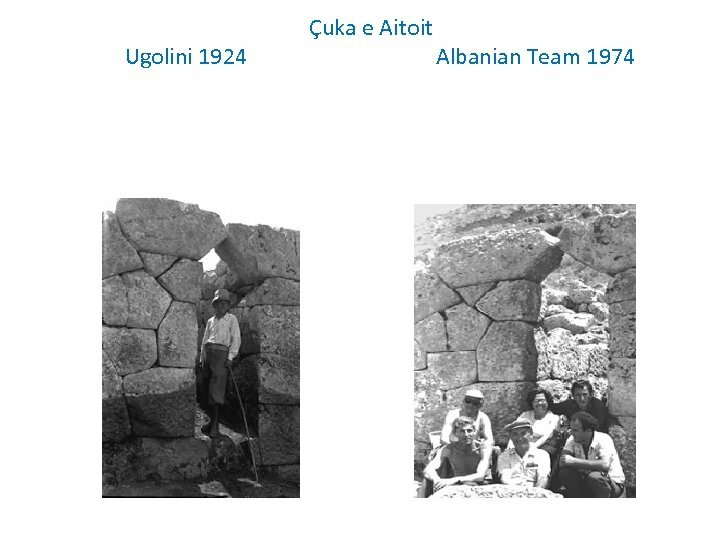 After that were closed totally both French and Italian Archaeological Missions in Albania, although French Mission had already almost closed since 1938. The hiatus in archaeological research lasted a year. 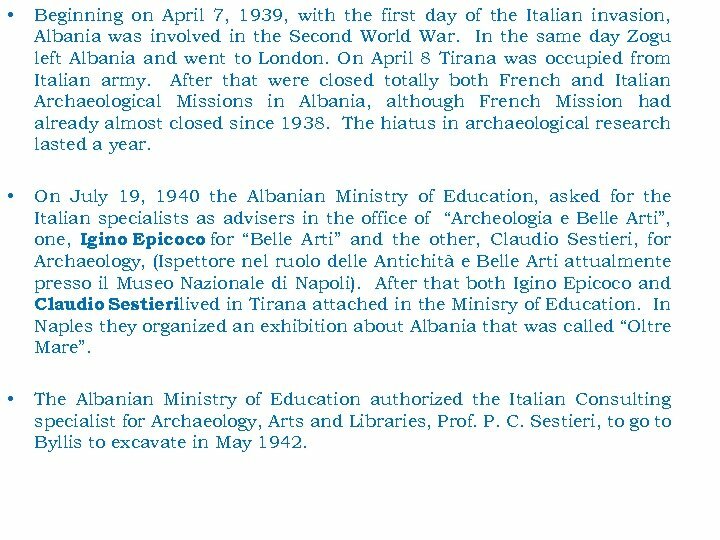 • On July 19, 1940 the Albanian Ministry of Education, asked for the Italian specialists as advisers in the office of “Archeologia e Belle Arti”, one, Igino Epicoco for “Belle Arti” and the other, Claudio Sestieri, for Archaeology, (Ispettore nel ruolo delle Antichità e Belle Arti attualmente presso il Museo Nazionale di Napoli). After that both Igino Epicoco and Claudio Sestierilived in Tirana attached in the Minisry of Education. In Naples they organized an exhibition about Albania that was called “Oltre Mare”. 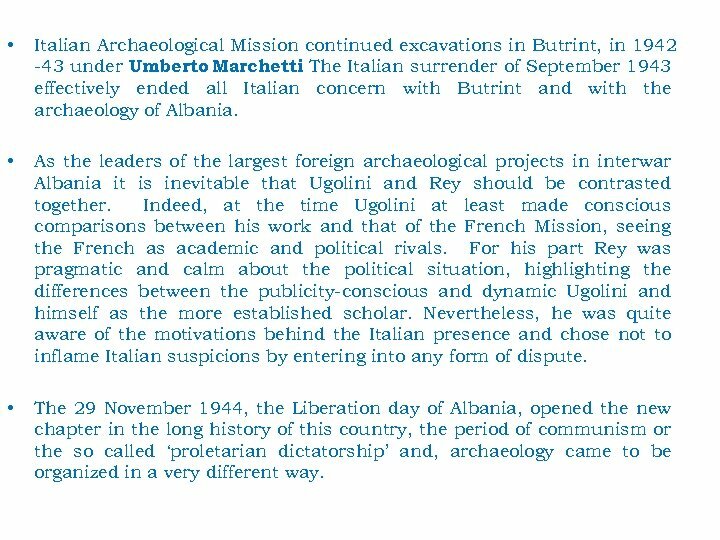 • The Albanian Ministry of Education authorized the Italian Consulting specialist for Archaeology, Arts and Libraries, Prof. P. C. Sestieri, to go to Byllis to excavate in May 1942. 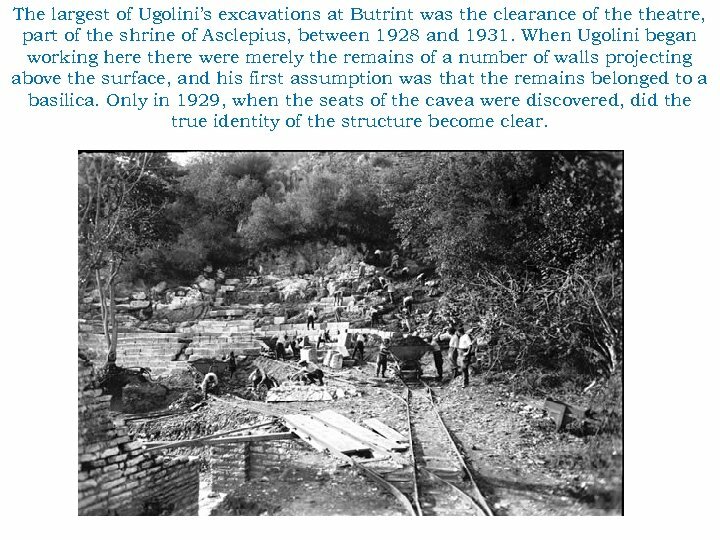 • Italian Archaeological Mission continued excavations in Butrint, in 1942 -43 under Umberto Marchetti The Italian surrender of September 1943. effectively ended all Italian concern with Butrint and with the archaeology of Albania. 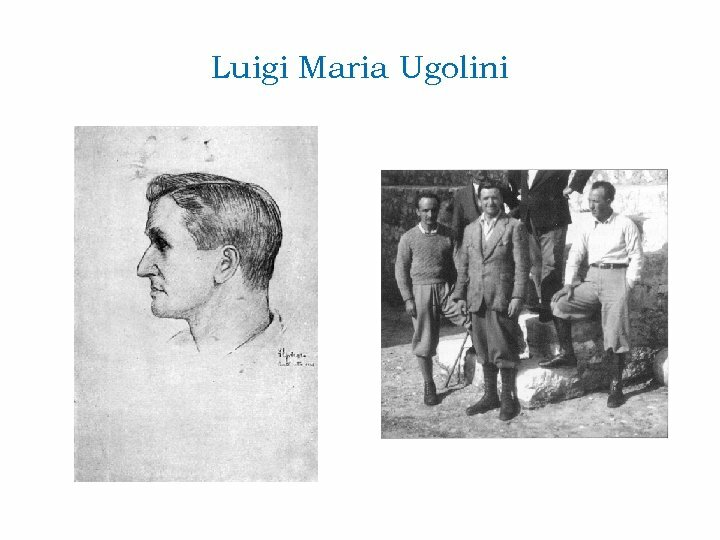 • As the leaders of the largest foreign archaeological projects in interwar Albania it is inevitable that Ugolini and Rey should be contrasted together. 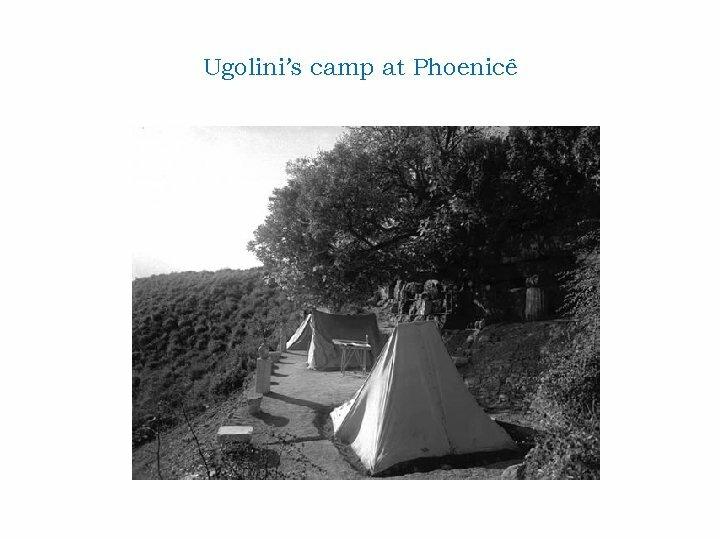 Indeed, at the time Ugolini at least made conscious comparisons between his work and that of the French Mission, seeing the French as academic and political rivals. For his part Rey was pragmatic and calm about the political situation, highlighting the differences between the publicity-conscious and dynamic Ugolini and himself as the more established scholar. Nevertheless, he was quite aware of the motivations behind the Italian presence and chose not to inflame Italian suspicions by entering into any form of dispute. • The 29 November 1944, the Liberation day of Albania, opened the new chapter in the long history of this country, the period of communism or the so called ‘proletarian dictatorship’ and, archaeology came to be organized in a very different way. 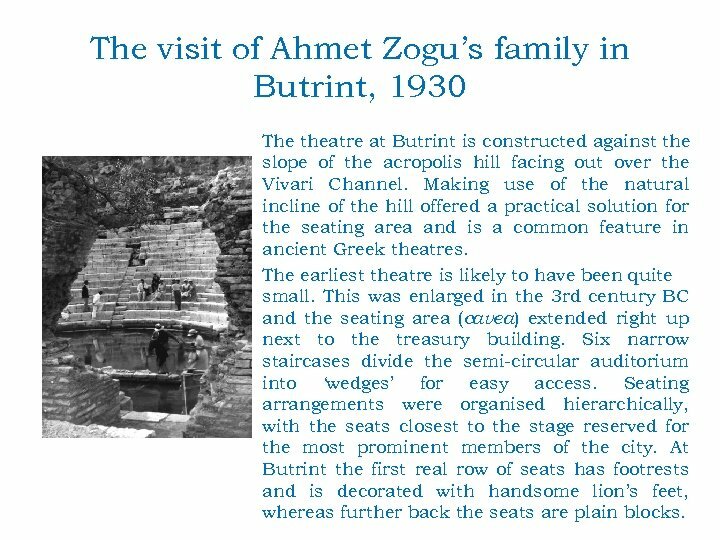 The visit of Ahmet Zogu’s family in Butrint, 1930 The theatre at Butrint is constructed against the slope of the acropolis hill facing out over the Vivari Channel. Making use of the natural incline of the hill offered a practical solution for the seating area and is a common feature in ancient Greek theatres. 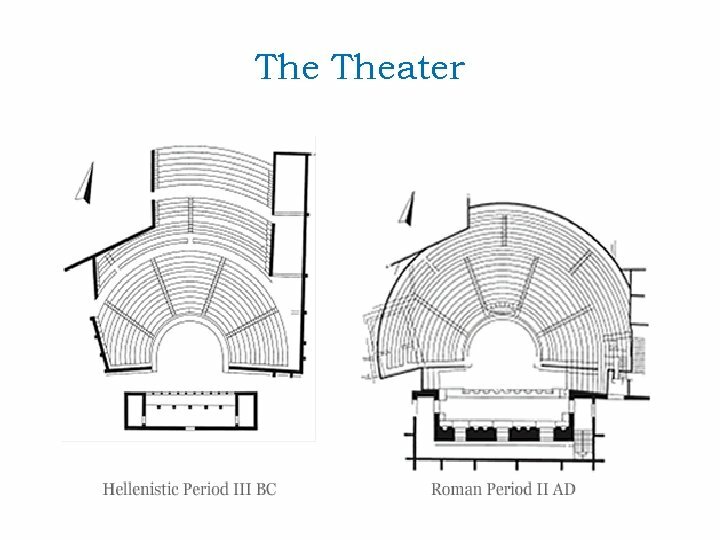 The earliest theatre is likely to have been quite small. This was enlarged in the 3 rd century BC and the seating area (cavea) extended right up next to the treasury building. Six narrow staircases divide the semi-circular auditorium into ‘wedges’ for easy access. Seating arrangements were organised hierarchically, with the seats closest to the stage reserved for the most prominent members of the city. At Butrint the first real row of seats has footrests and is decorated with handsome lion’s feet, whereas further back the seats are plain blocks. 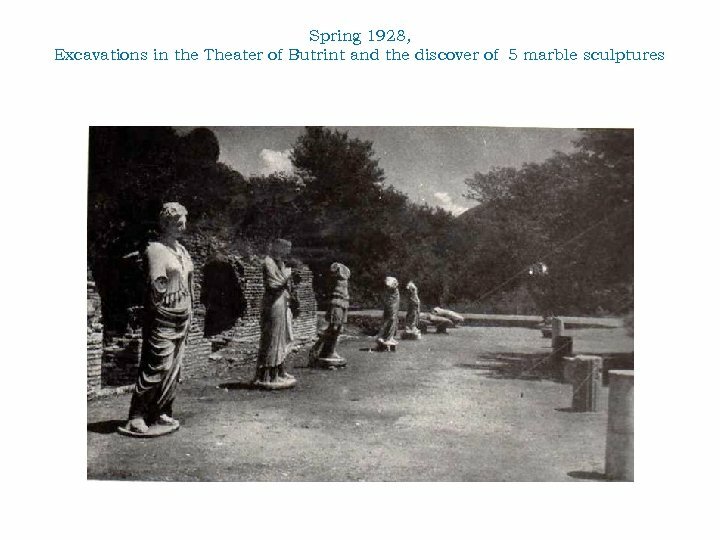 The largest of Ugolini’s excavations at Butrint was the clearance of theatre, part of the shrine of Asclepius, between 1928 and 1931. 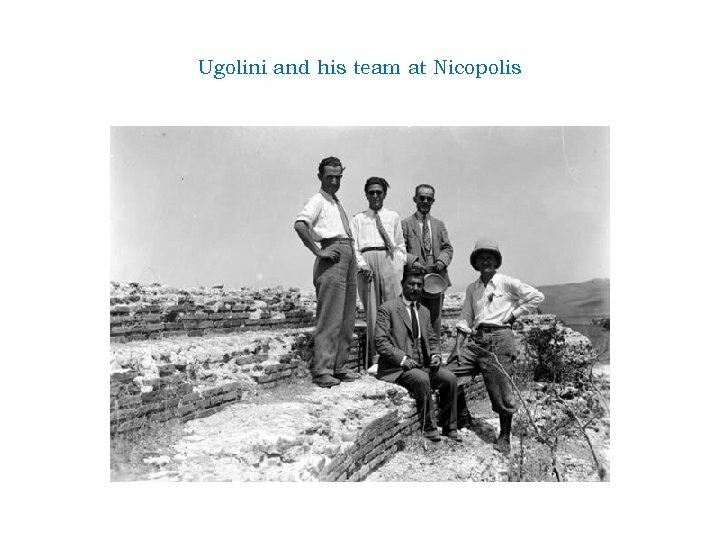 When Ugolini began working here there were merely the remains of a number of walls projecting above the surface, and his first assumption was that the remains belonged to a basilica. Only in 1929, when the seats of the cavea were discovered, did the true identity of the structure become clear. 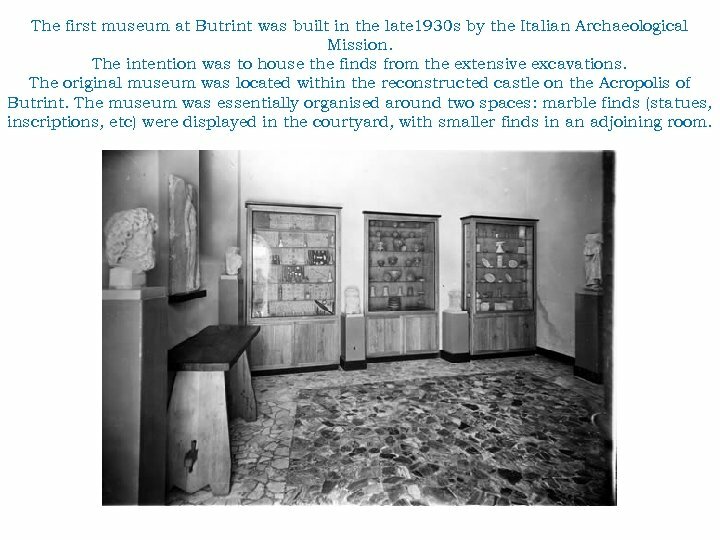 The first museum at Butrint was built in the late 1930 s by the Italian Archaeological Mission. The intention was to house the finds from the extensive excavations. The original museum was located within the reconstructed castle on the Acropolis of Butrint. The museum was essentially organised around two spaces: marble finds (statues, inscriptions, etc) were displayed in the courtyard, with smaller finds in an adjoining room. At Apollonia a major programme was jointly directed by Blavatski and Hasan Ceka, with the participation of around 200 specialists, students and workmen. At the classical site of Oricum, the team was directed by Tatania V. Blavatskaja (Blavatski’s wife) and Dhimosten Budina. 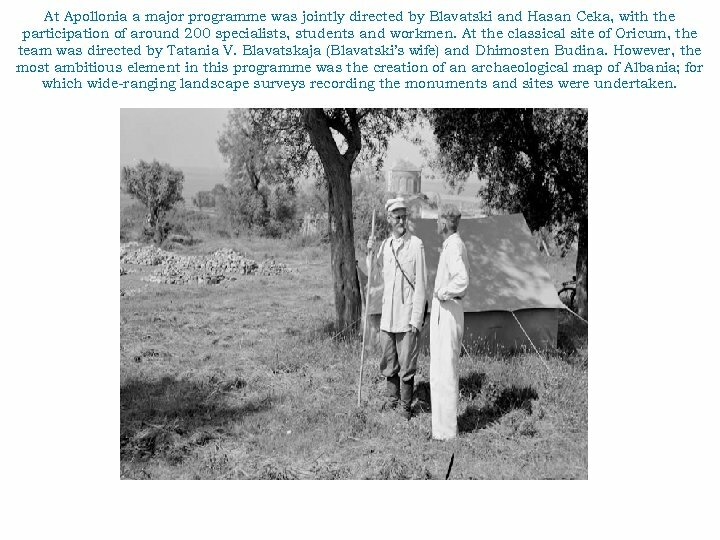 However, the most ambitious element in this programme was the creation of an archaeological map of Albania; for which wide-ranging landscape surveys recording the monuments and sites were undertaken. 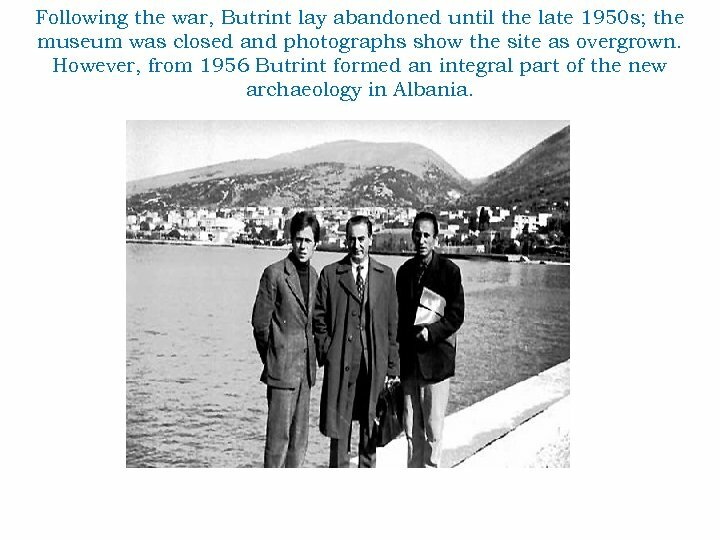 Following the war, Butrint lay abandoned until the late 1950 s; the museum was closed and photographs show the site as overgrown. 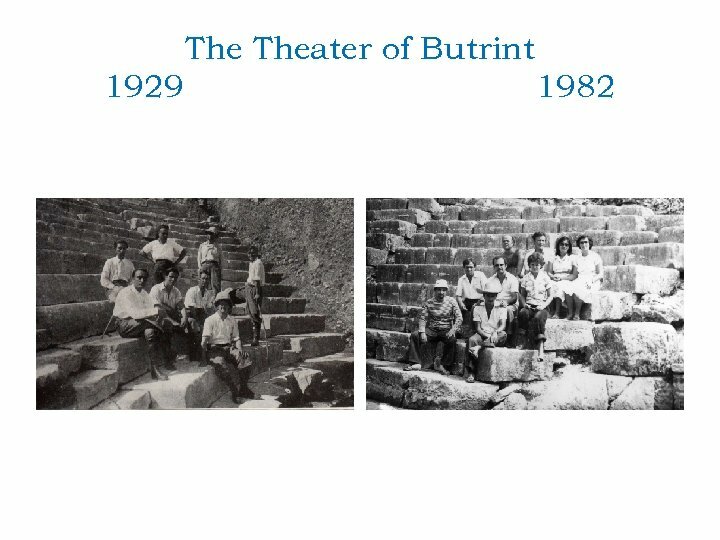 However, from 1956 Butrint formed an integral part of the new archaeology in Albania. NOMINATION OF THE ARCHITECTURAL MONUMENTS AND THE LEGISLATION OF THEIR PROTECTION • BEING UNDER A CONSTRUCTION DEVELOPMENT, IS DANGEROUS FOR THE ARCHITECTURAL HERITAGE. 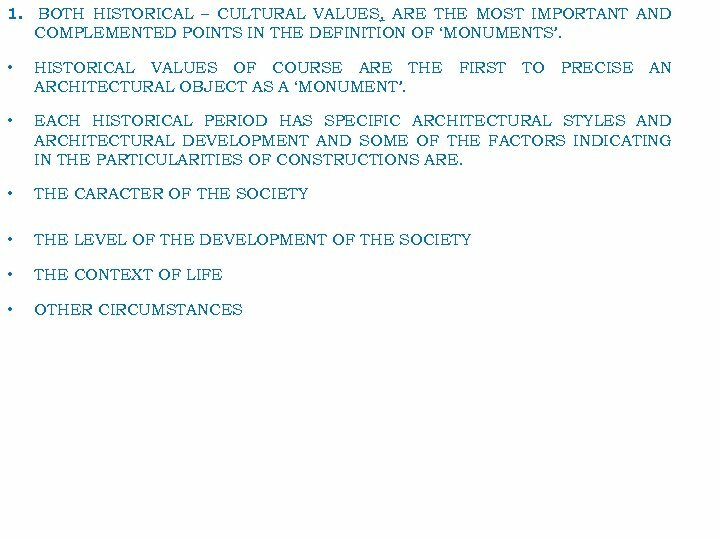 IT IS VERY IMPORTANT TO NAME THESE VALUES IN THE LIST OF MONUMENTS, OTHERWISE THEY ARE NOT UNDER PROTECTION. THE SELECTION NEEDS TO BE ONLY PROFESSIONAL. • THE VALUETION OF THE MONUMENTS INCLUDES THE NOMINATION OF ARCHITECTURAL VALUES AND THE HISTORICAL-CULTURAL VALUES. • ACTUALLY IN ALBANIA THIS EXPERIENCE DATED ONLY AFTER THE END OF THE WORLD WAR II. IN THE VERY BEGINNING WAS A SMALL NUMBER OF PROFESSIONALS, MOSTLY OF THEM WERE WELL EDUCATED ABROAD. 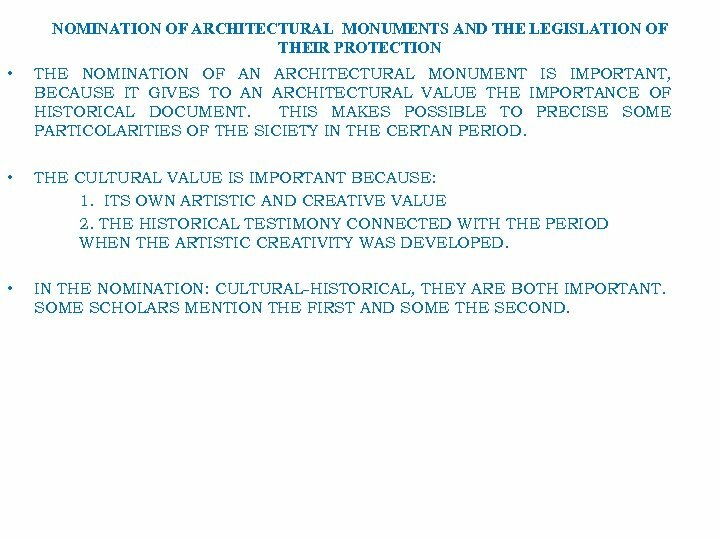 NOMINATION OF ARCHITECTURAL MONUMENTS AND THE LEGISLATION OF THEIR PROTECTION • THE NOMINATION OF AN ARCHITECTURAL MONUMENT IS IMPORTANT, BECAUSE IT GIVES TO AN ARCHITECTURAL VALUE THE IMPORTANCE OF HISTORICAL DOCUMENT. THIS MAKES POSSIBLE TO PRECISE SOME PARTICOLARITIES OF THE SICIETY IN THE CERTAN PERIOD. • THE CULTURAL VALUE IS IMPORTANT BECAUSE: 1. ITS OWN ARTISTIC AND CREATIVE VALUE 2. THE HISTORICAL TESTIMONY CONNECTED WITH THE PERIOD WHEN THE ARTISTIC CREATIVITY WAS DEVELOPED. • IN THE NOMINATION: CULTURAL-HISTORICAL, THEY ARE BOTH IMPORTANT. SOME SCHOLARS MENTION THE FIRST AND SOME THE SECOND. Enver Hoxha’s post-war communist regime in Albania had close ties with Stalin’s Soviet Union. However, with Stalin’s death, Hoxha began to suspect the Soviet leadership of betraying the ideals of Leninism. In May 1959, in an effort to heal the developing rift, Hoxha invited Nikita Khrushchev and his defence minister, Marshal Malinovski, to visit Albania. 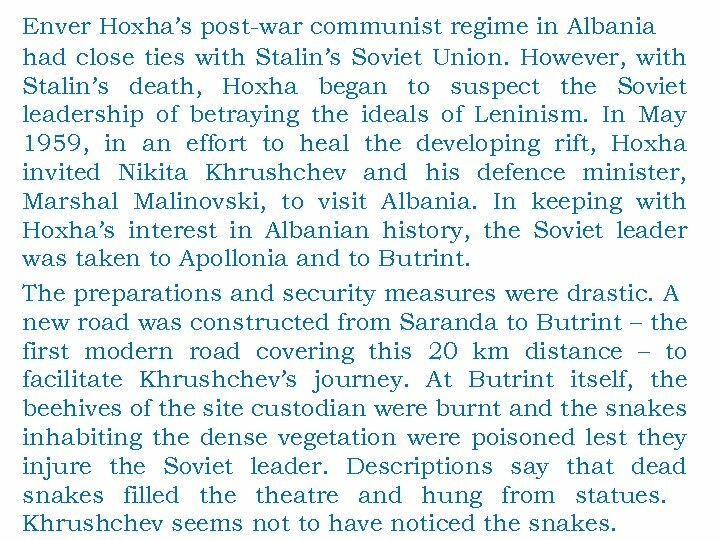 In keeping with Hoxha’s interest in Albanian history, the Soviet leader was taken to Apollonia and to Butrint. The preparations and security measures were drastic. A new road was constructed from Saranda to Butrint – the first modern road covering this 20 km distance – to facilitate Khrushchev’s journey. At Butrint itself, the beehives of the site custodian were burnt and the snakes inhabiting the dense vegetation were poisoned lest they injure the Soviet leader. Descriptions say that dead snakes filled theatre and hung from statues. Khrushchev seems not to have noticed the snakes. In May 1959, in an effort to heal the developing rift, Hoxha invited Nikita Khrushchev and his defence minister, Marshal Malinovski, to visit Albania. 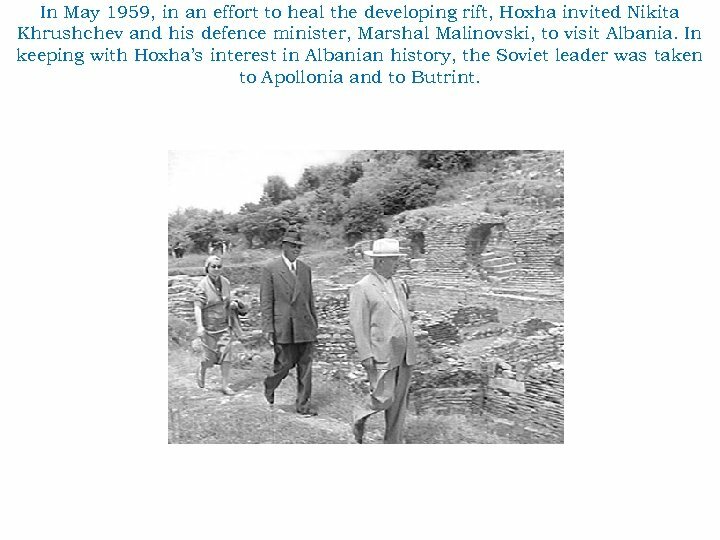 In keeping with Hoxha’s interest in Albanian history, the Soviet leader was taken to Apollonia and to Butrint. 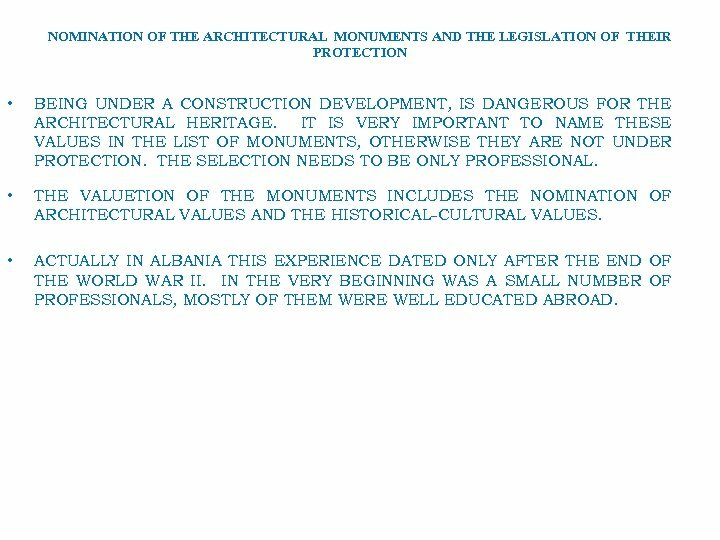 NOMINATION OF ARCHITECTURAL MONUMENTS AND THE LEGISLATION OF THEIR PROTECTION 2. 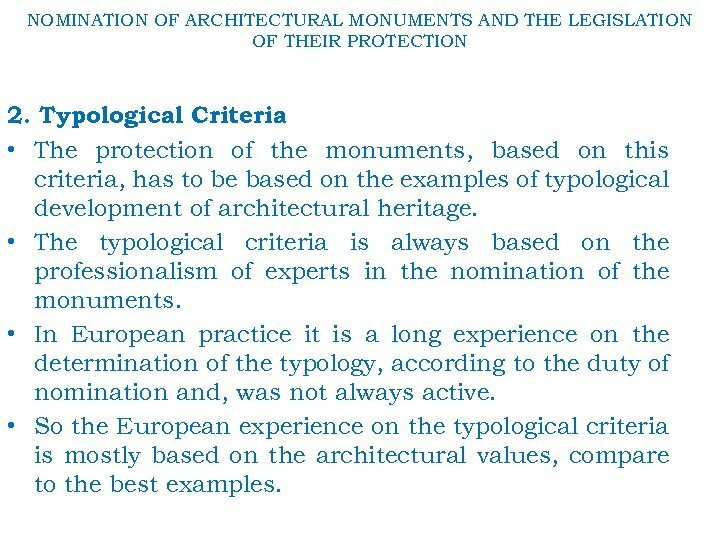 Typological Criteria • The protection of the monuments, based on this criteria, has to be based on the examples of typological development of architectural heritage. • The typological criteria is always based on the professionalism of experts in the nomination of the monuments. • In European practice it is a long experience on the determination of the typology, according to the duty of nomination and, was not always active. • So the European experience on the typological criteria is mostly based on the architectural values, compare to the best examples. 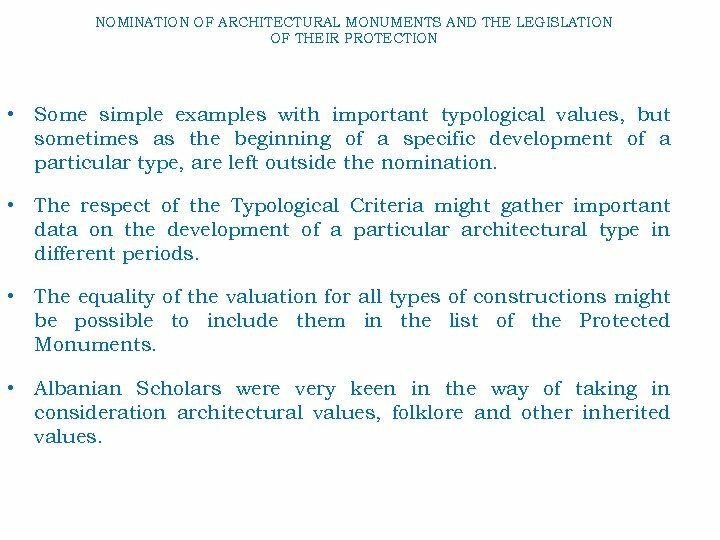 NOMINATION OF ARCHITECTURAL MONUMENTS AND THE LEGISLATION OF THEIR PROTECTION • Some simple examples with important typological values, but sometimes as the beginning of a specific development of a particular type, are left outside the nomination. • The respect of the Typological Criteria might gather important data on the development of a particular architectural type in different periods. • The equality of the valuation for all types of constructions might be possible to include them in the list of the Protected Monuments. • Albanian Scholars were very keen in the way of taking in consideration architectural values, folklore and other inherited values. 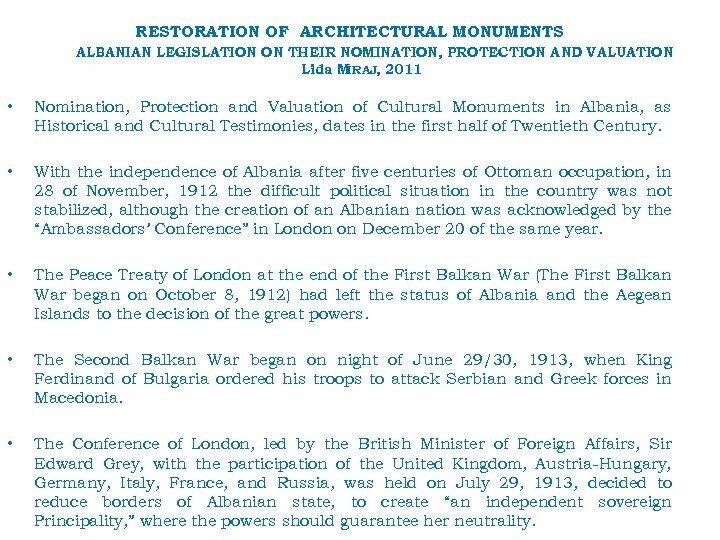 NOMINATION OF ARCHITECTURAL MONUMENTS AND THE LEGISLATION OF THEIR PROTECTION • Other countries were with earlier experiences on the protection of inherited values. 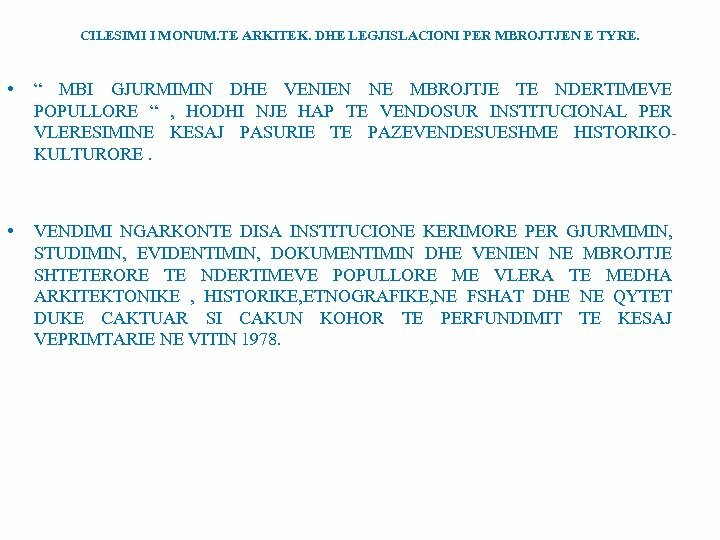 • Albania in 1961 approved the law of the Protection of Museum. Cities. Two very important museum-cities were the first to enter in the list: Berat and Gjirokastra. 3. The Criteria of Authenticity • This very important criteria is that the architectural object has to be protected partly or entirely, mostly based on the original values. 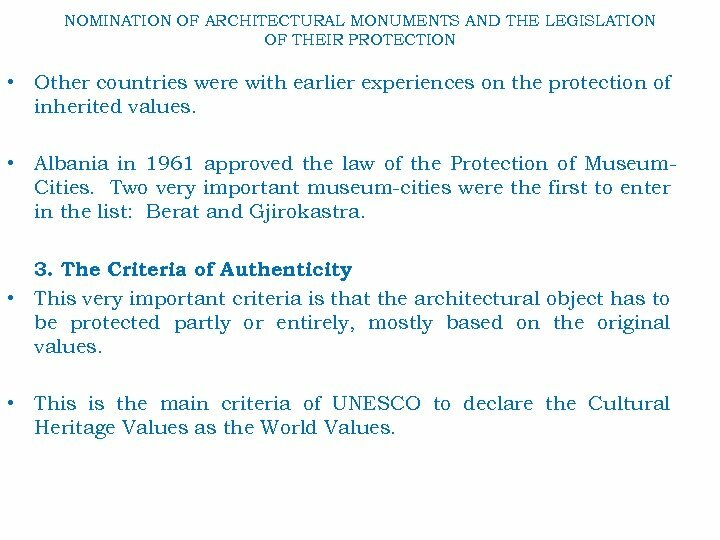 • This is the main criteria of UNESCO to declare the Cultural Heritage Values as the World Values. 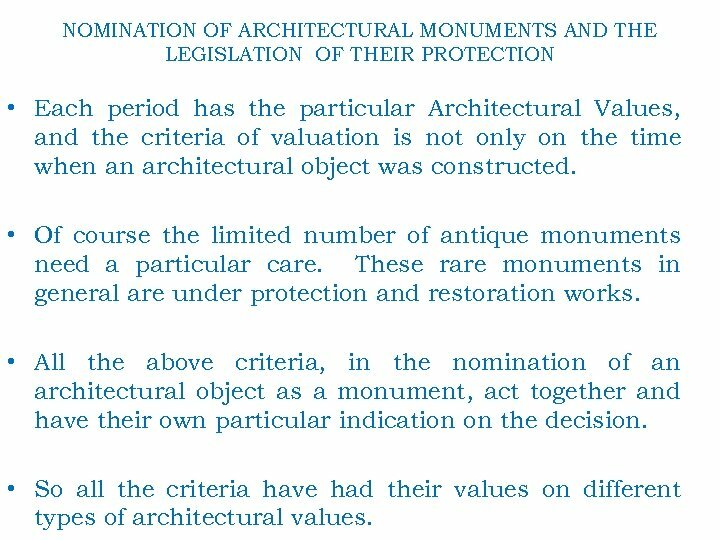 NOMINATION OF ARCHITECTURAL MONUMENTS AND THE LEGISLATION OF THEIR PROTECTION • Each period has the particular Architectural Values, and the criteria of valuation is not only on the time when an architectural object was constructed. • Of course the limited number of antique monuments need a particular care. These rare monuments in general are under protection and restoration works. 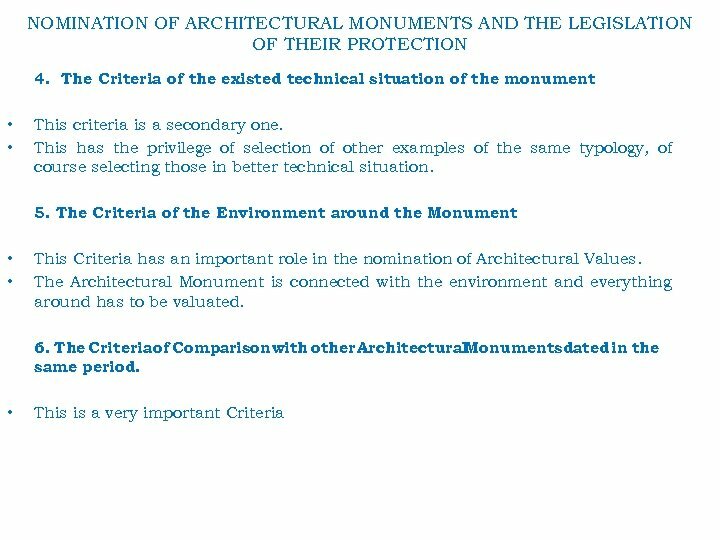 • All the above criteria, in the nomination of an architectural object as a monument, act together and have their own particular indication on the decision. • So all the criteria have had their values on different types of architectural values. 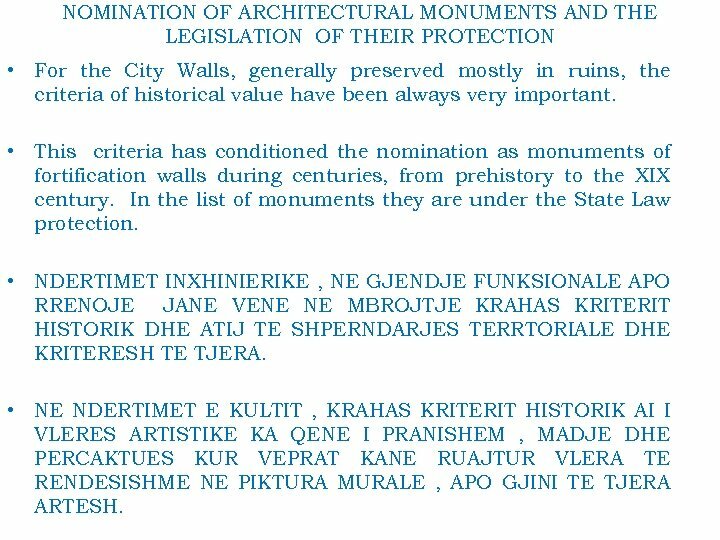 NOMINATION OF ARCHITECTURAL MONUMENTS AND THE LEGISLATION OF THEIR PROTECTION • For the City Walls, generally preserved mostly in ruins, the criteria of historical value have been always very important. • This criteria has conditioned the nomination as monuments of fortification walls during centuries, from prehistory to the XIX century. In the list of monuments they are under the State Law protection. • NDERTIMET INXHINIERIKE , NE GJENDJE FUNKSIONALE APO RRENOJE JANE VENE NE MBROJTJE KRAHAS KRITERIT HISTORIK DHE ATIJ TE SHPERNDARJES TERRTORIALE DHE KRITERESH TE TJERA. • NE NDERTIMET E KULTIT , KRAHAS KRITERIT HISTORIK AI I VLERES ARTISTIKE KA QENE I PRANISHEM , MADJE DHE PERCAKTUES KUR VEPRAT KANE RUAJTUR VLERA TE RENDESISHME NE PIKTURA MURALE , APO GJINI TE TJERA ARTESH. CILESIMI I MONUM. TE ARKITEK. DHE LEGJISLACIONI PER MBROJTJEN E TYRE. L. 10 • EDHE KRITERI TIPOLOGJIK DHE AI PERHAPJES TERRITORIALE KANE QENE NE DISA RASTE NDIKUES OSE PERCAKTUES NE CILESINE E VEPRES SE KULTIT MONUMENT. • GJINIA E NDERTIMEVE POPULLORE , GJURMIMI SISTEMATIK I SE CILES U KRYE PAS VITEVE 1970, KUR SPECIALISTET SHQIPTAR TE FUSHES ISHIN FORMUAR PROFESIONALISHT NE NIVELET E DUHURA , SHFAQET SI SHEMBULLI NE TE CILIN KRITERET E VENIES NE MBROJTJE TE MONUMENTEVE JANE ZBATUAR NE BASHKEVEPRIMIN E DUHUR , DUKE DHENE PERFUNDIME TE VLERESUESHME. • KRAHAS MONUMENTEVE TE VECANTE NE KETE GJINI , SIC E PERMENDEM ME LART QE NE 1961, JANE VENE NE MBROJTJE EDHE MBARE QENDRA TE BANUARA QYTETARE. CILESIMI I MONUM. TE ARKITEK. DHE LEGJISLACIONI PER MBROJTJEN E TYRE. 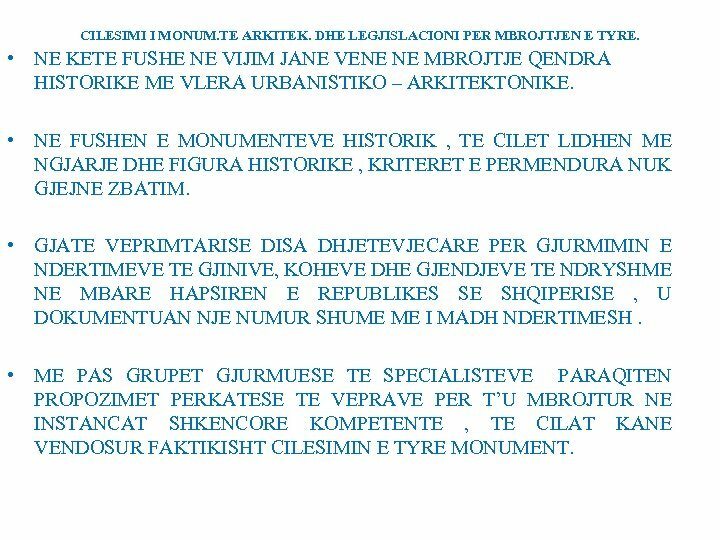 • NE KETE FUSHE NE VIJIM JANE VENE NE MBROJTJE QENDRA HISTORIKE ME VLERA URBANISTIKO – ARKITEKTONIKE. • NE FUSHEN E MONUMENTEVE HISTORIK , TE CILET LIDHEN ME NGJARJE DHE FIGURA HISTORIKE , KRITERET E PERMENDURA NUK GJEJNE ZBATIM. • GJATE VEPRIMTARISE DISA DHJETEVJECARE PER GJURMIMIN E NDERTIMEVE TE GJINIVE, KOHEVE DHE GJENDJEVE TE NDRYSHME NE MBARE HAPSIREN E REPUBLIKES SE SHQIPERISE , U DOKUMENTUAN NJE NUMUR SHUME ME I MADH NDERTIMESH. 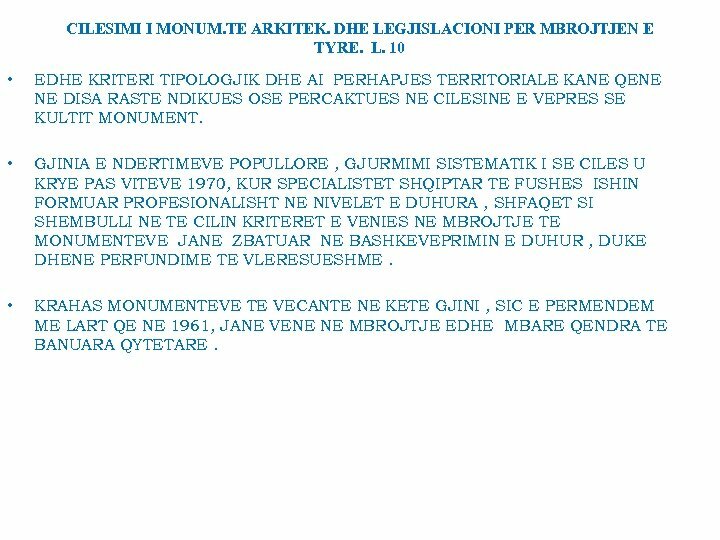 • ME PAS GRUPET GJURMUESE TE SPECIALISTEVE PARAQITEN PROPOZIMET PERKATESE TE VEPRAVE PER T’U MBROJTUR NE INSTANCAT SHKENCORE KOMPETENTE , TE CILAT KANE VENDOSUR FAKTIKISHT CILESIMIN E TYRE MONUMENT. Institutii Monumentevetë Kulturës (IMK) është institucion shkencor buxhetor, në varësi të Ministrisë së Turizmit, Kulturës, Rinisë dhe Sporteve. Veprimtaria e IMK, mbështetet në Ligjin nr. 9048. dt. 07. 04. 2003, "Për trashëgiminë kulturore", si dhe në gjithë legjislacionin shqiptar në fuqi. IMK është themeluar në vitin 1965 mbi bazën e sektorit të Restaurimit të Grupit të Kulturës Materiale pranë Universitetit të Tiranës, i cili përkujdesej për mirëmbajtjen e monumenteve të kulturës para krijimit të IMK, sipas Vendimit Nº 67, datë 15/03/1965 të Këshillit të Ministrave. 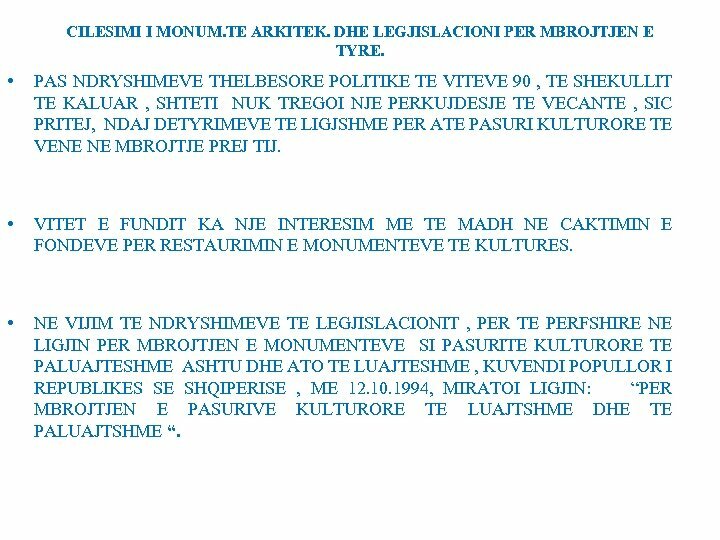 Detyra themelore e IMK, është mbrojtja, restaurimi dhe rijetësimi i monumenteve kulturore-historike të trashëguara. 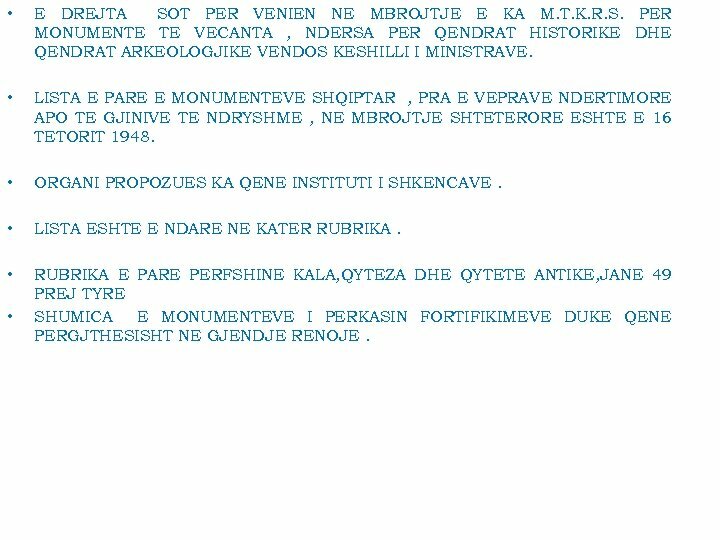 IMK ndërton punën kërkimorestudimore, ndjek zbatimin e legjislacionit në fushën e monumenteve të kulturës, kryen veprime konkrete mbi monumentet e paluajtshme dhe të luajtshme që janë pjesë tërësore e tyre, në të gjithë territorin e Republikës së Shqipërisë, bën kualifikimin e kuadrit, autorizon, përcakton kriteret e restaurimit dhe merr të gjitha masat që sigurojnë gjurmimin, evidentimin e monumenteve, mbrojtjen, restaurimin shkencor dhe dokumentimin e plotë të tyre. 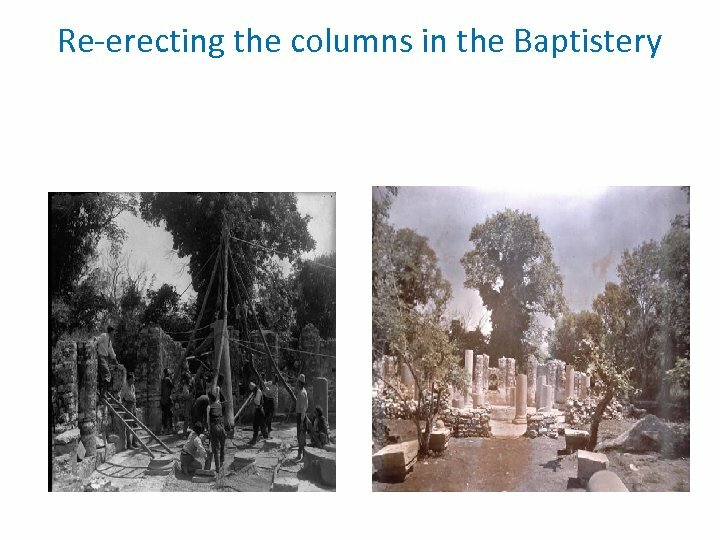 IMK aktivitetin e vet e kryen në bashkëpunim me Drejtoritë Rajonale të Monumenteve të Kulturës në qarqet e ndryshme të vendit. CILESIMI I MONUM. TE ARKITEK. DHE LEGJISLACIONI PER MBROJTJEN E TYRE • KRAHAS NE KETE RUBRIKE PERFSHIHEN EDHE QENDRAT ARKEOLOGJIKE TE BUTRINTIT DHE POJANIT, TE CILAT PERFSHIJNE NJE NUMUR TE MADH MONUMENTESH TE ZBULUARA DHE ENDE TE PAZBULUARA. • RUBRIKA E DYTE LIDHET ME KISHAT DHE MANASTIRET. • RUBRIKA E TRETE PERFSHINE, URA, UJESJELLESA , SHPELLA , KULLA, GJITHSEJ 11 PREJ TYRE • RUBRIKA E KATERT LIDHET ME MONUMENTET E KULTIT MUSLIMAN XHAMIA, TEQE DHE TYRBE , GJITHSEJ 11 PREJ TYRE. 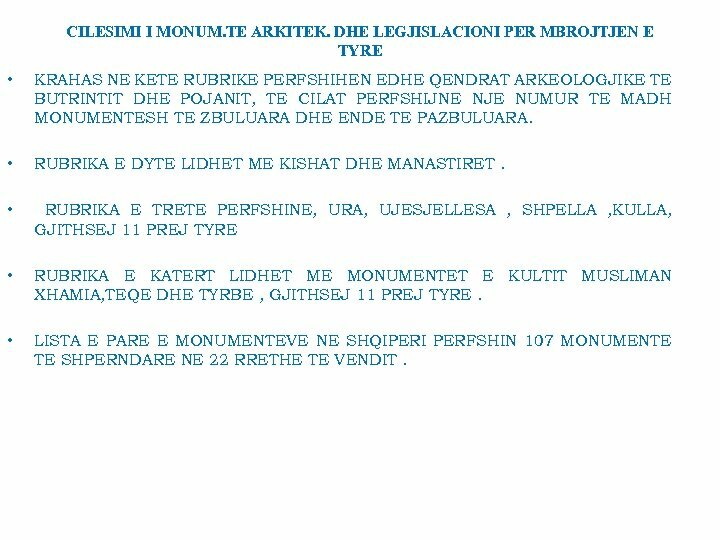 • LISTA E PARE E MONUMENTEVE NE SHQIPERI PERFSHIN 107 MONUMENTE TE SHPERNDARE NE 22 RRETHE TE VENDIT. CILESIMI I MONUM. TE ARKITEK. DHE LEGJISLACIONI PER MBROJTJEN E TYRE. • KJO LISTE E HARTUAR KRYESISHT PREJ ARKEOLOGESH , KA QENDRUAR NE SHEMBUJT ME TE ARRITUR TE GJINIVE TE PERMENDURA DHE ESHTE E PAQORTUESHME EDHE SOT E KESAJ DITE. • MUNGESA E NDERTIMEVE POPULLORE DHE NDERTIMEVE TE LIDHURA ME NGJARJE OSE FIGURA HISTORIKE ESHTE E KUPTUESHME PER KOHEN. • NE VITIN 1961 , KRAHAS VENIES NE MBROJTJE TE QYTETEVE – MUZE TE BERATIT DHE GJIROKASTRES, NENTOKES SE DURRESIT DHE PAZARIT TE VJETER TE KRUJES, SHPALLET LISTA E DYTE E CILA LIDHET ME QYTETIN – MUZE TE BERATIT. 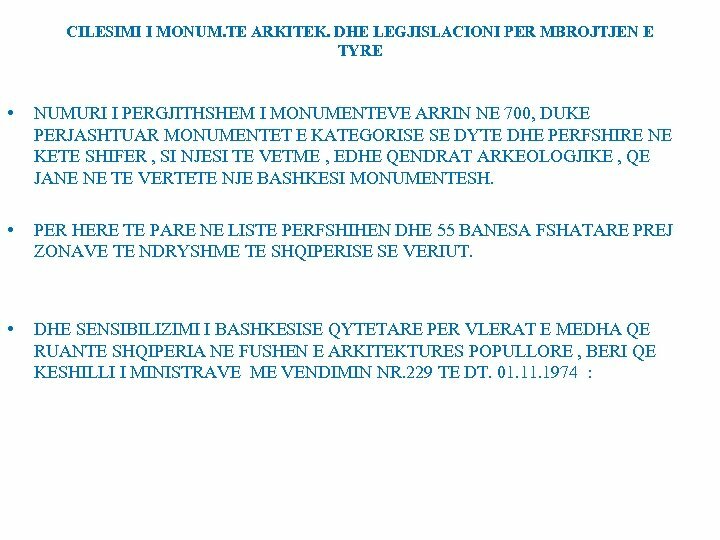 • NE KETE LISTE , PREJ 80 MONUMENTESH TE RINJ, PERFSHIHEN GJINI TE NDRYSHME NDERTIMORE TE QYTETIT DUKE ZENE 54 BANESAT , VENDIN E PARE PER NGA NUMURI. CILESIMI I MONUM. TE ARKITEK. DHE LEGJISLACIONI PER MBROJTJEN E TYRE • LISTA E TRETE E MONUMENTEVE NE SHQIPERI , I PERKETE VITIT 1963, AJO ESHTE E MIRATUAR PREJ UNIVERSITETIT TE TIRANES. 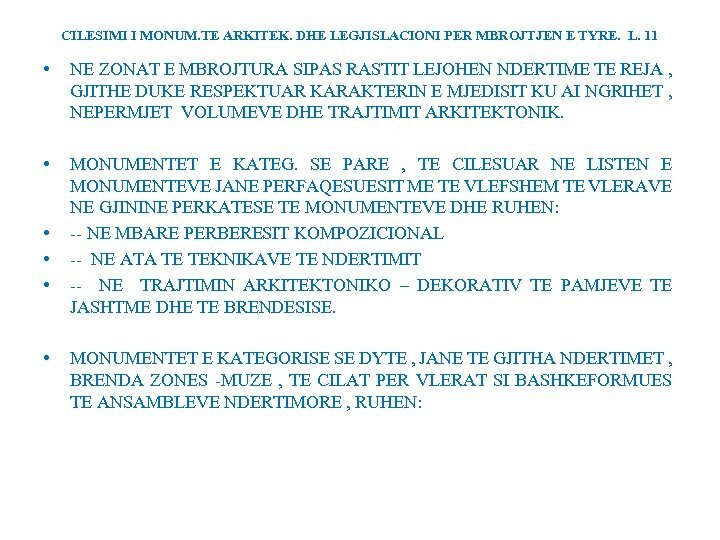 NE KETE LISTE , PERFSHIHEN EDHE MONUMENTET E SHPALLUR ME PARE , DUKE ARRITUR NUMURI I MONUMENTEVE NE MBROJTJE SHTETERORE NE 471 , TE GJITHE FUSHAVE DHE GJINIVE. • NE VITIN 1967, SHENON PER MONUMENTET SHQIPTARE TE KULTIT , VITIN E ZI TE SHPERFILLJES DHE RRENIMIT NE KUSHTET E DIKTATURES SE SKAJME. • PREJ NUMURIT TE PERGJITHSHEM PREJ 214 MONUMENTESH KULTI, U HOQEN NGA MBROJTJA 74 PRA 34% PREJ TYRE. • NE VITIN 1973, MINISTRIA E ARSIMIT DHE KULTURES BOTON LISTEN E PLOTE TE MONUMENTEVE NE SHQIPERI. CILESIMI I MONUM. TE ARKITEK. DHE LEGJISLACIONI PER MBROJTJEN E TYRE. 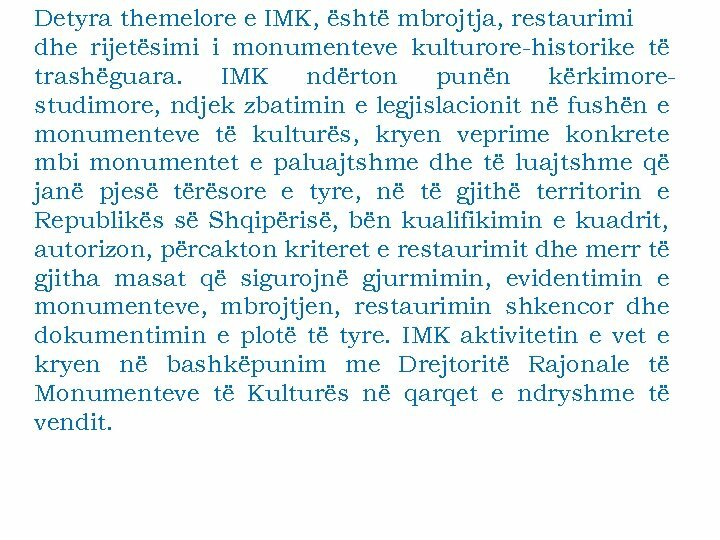 • “ MBI GJURMIMIN DHE VENIEN NE MBROJTJE TE NDERTIMEVE POPULLORE “ , HODHI NJE HAP TE VENDOSUR INSTITUCIONAL PER VLERESIMINE KESAJ PASURIE TE PAZEVENDESUESHME HISTORIKOKULTURORE. • VENDIMI NGARKONTE DISA INSTITUCIONE KERIMORE PER GJURMIMIN, STUDIMIN, EVIDENTIMIN, DOKUMENTIMIN DHE VENIEN NE MBROJTJE SHTETERORE TE NDERTIMEVE POPULLORE ME VLERA TE MEDHA ARKITEKTONIKE , HISTORIKE, ETNOGRAFIKE, NE FSHAT DHE NE QYTET DUKE CAKTUAR SI CAKUN KOHOR TE PERFUNDIMIT TE KESAJ VEPRIMTARIE NE VITIN 1978. CILESIMI I MONUM. TE ARKITEK. DHE LEGJISLACIONI PER MBROJTJEN E TYRE • ATY HIDHEJ IDEJA DHE E KRIJIMIT TE MUZEUT TE FSHATIT NE NATYRE. • VEPRIMTARIA GJURMUESE PER IDENTIFIKIMIN DHE VENIEN NE MBROJTJE TE NDERTIMEVE POPULLORE U REALIZUA ME 35 EKSPEDITA NE MBARE VENDIN, DUKE GRUMBULLUAR NJE MATERIAL TE GJERE DOKUMENTAR , GRAFIK, FOTOGRAFIK, DHE PERSHKRIMOR. 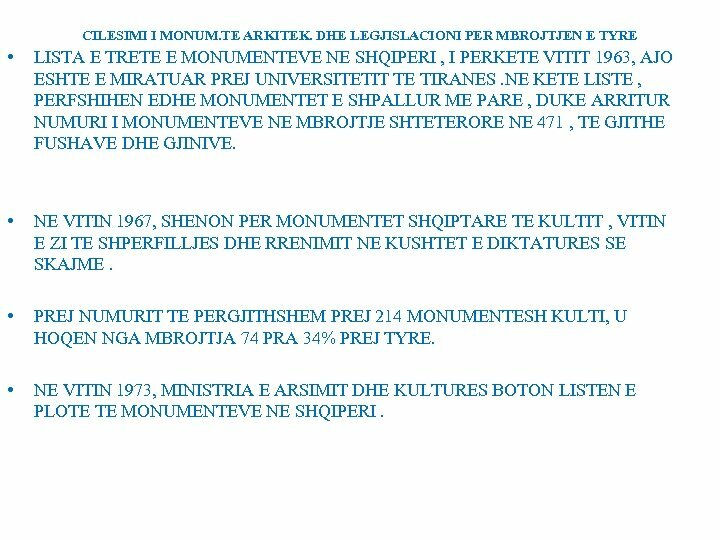 • NE VITIN 1979 , MINISTRIA E ARSIMIT DHE KULTURES VENDOS KALIMIN NE MBROJTJE SHTETERORE NE CILESINE E MONUMENTEVE 132 VEPRA NDERTIMORE , KRYESISHT BANESA POPULLORE. • GJATE VITEVE 1981, 1982, 1983 LISTAVE PARAARDHESE JU SHTOHEN DHE 35 MONUMENTE. CILESIMI I MONUM. TE ARKITEK. DHE LEGJISLACIONI PER MBROJTJEN E TYRE. L. 11 • GJIROKASTER 540 , BERAT 428, KORCE 150 , SHKODER 80 , VLORE 25 , ELBASAN 20, PRA GJITHSEJ 1234 MONUMENTE TE KATEG. SE DYTE. • DHJETVJECARET E FUNDIT , KUJDESI PER MONUMENTET NUK KA QENE NE NIVELIN QE PRITEJ. • JANE VENE NE MBROJTJE QENDRA HISTORIKE E TIRANES ME NJE STUDIM JO TE THELLUAR DHE DISA MONUMENTE TE VECUAR. 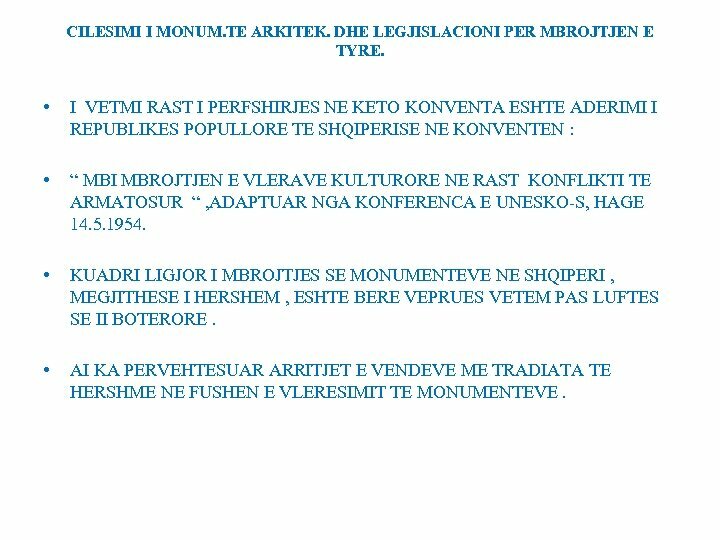 • PER MBROJTJEN E MONUMENTEVE VLERE TE VECANTE ZE KUADRI LIGJOR PER VLERESIMIN E MONUMENTEVE. • NE RASTIN SHQIPTAR DERI NE LUFTEN E DYTE BOTERORE AKTET LIGJORE , MEGJITHESE TE MANGETA , KANE QENE TE PRANISHME QE NE VITIN 1889 , KUR SHQIPERIA ENDE PERFSHIHEJ NE SUAZEN E PERANDORISE TURKE. CILESIMI I MONUM. TE ARKITEK. DHE LEGJISLACIONI PER MBROJTJEN E TYRE. • BEHET FJALE PER RREGULLOREN E BRENDESHME PER RREGULLIMIN E MUZEUT MBRETEROR PREJ 43 NENESH , E CILA NGARKONTE KETE INSTITUCION EDHE ME ZBULIMIN DHE MBROJTJEN E NDERTESAVE TE VJETRA DHE MONUMENTEVE QE DO TE DILNIN NE DRITE NGA GERMIMET. 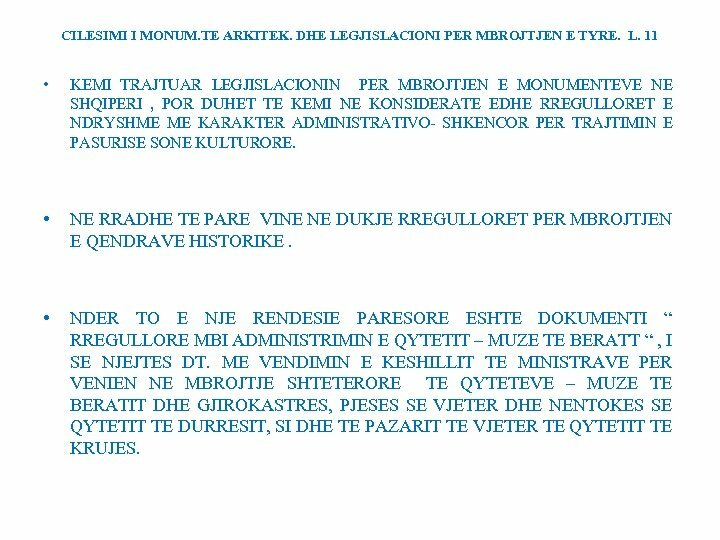 • LIGJI PER MBROJTJEN E MONUMENTEVE I DATES 08. 07. 1912, ZGJERONTE SFEREN E NDERTIMEVE TE VJETRA TE PERFSHIRA NE TERMIN “ANTIKITET • KETO AKTE NUK PATEN ZBATIM NE TROJET SHPTARE. • AKTI I PARE LIGJOR I SHQIPERISE SE PAVARUR ESHTE QARKORJA E MINISTRISE SE ARSIMIT NR. 923 , DT 19. 06. 1922. 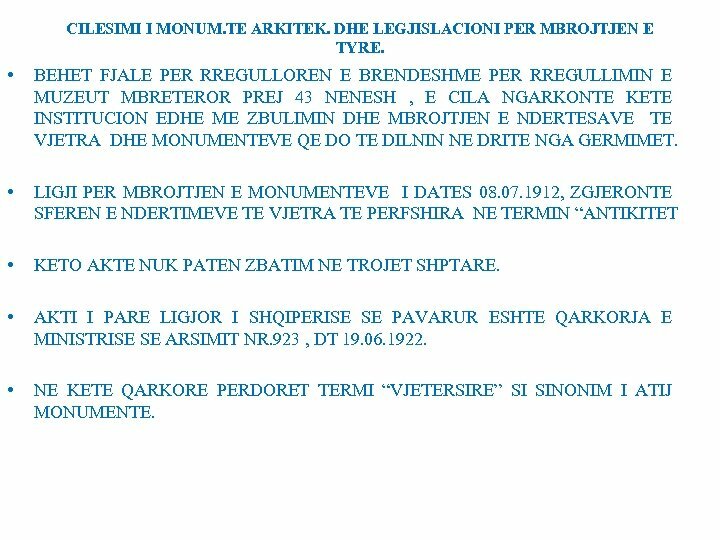 • NE KETE QARKORE PERDORET TERMI “VJETERSIRE” SI SINONIM I ATIJ MONUMENTE. CILESIMI I MONUM. TE ARKITEK. DHE LEGJISLACIONI PER MBROJTJEN E TYRE. L. 11 • NE KETE DOKUMENTE PERMENDEN NDONJE KISHE APO XHAMI , NJE QYTET OSE KATUND , NDONJE FORTESE E VJETER , PER TE CILEN KA NDONJE GOJEDHENE. • VLERA E KETIJ AKTI ESHTE E RENDESISHME SEPSE TREGON INTERESIMIN E SHTETIT TE SAPOFORMUAR SHQIPTAR PER TRASHEGIMINE KULTURORE. • NJE I HAP I RENDESISHEM PERPARA SHENON DEKRETI “ PER MONUMNTET KOMBETARE” I DT. 28. 05. 1929. • CILESORI KOMBETAR KRAHAS TERMIT MONUMENT ESHTE ME DOMETHENIE TE QARTE. 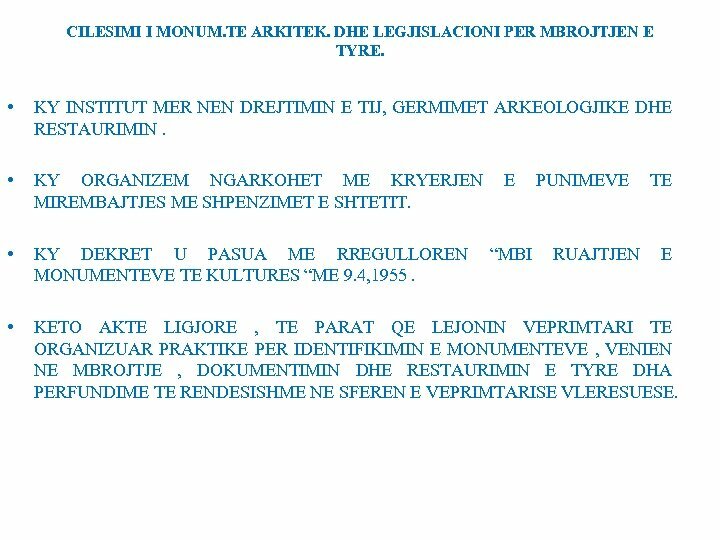 MINISTRIA E ARSIMIT CAKTOHET SI INSTITUCION I NGARKUAR PER RUAJTJEN E MONUMENTEVE. 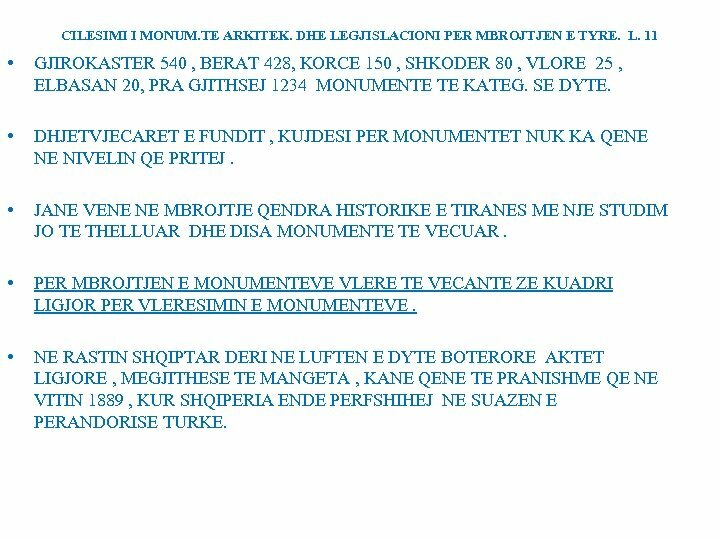 • TE DY KETO AKTE LIGJORE MBETEN PA U ZBATUAR , SEPSE NUK U SHOQERUAN ME SHPALLJE MONUMENTESH. CILESIMI I MONUM. TE ARKITEK. DHE LEGJISLACIONI PER MBROJTJEN E TYRE. L. 11 • PAS LUFTES SE DYTE BOTERORE , FILLON VEPRIMTARIA SISTEMATIKE PER VLERESIMIN E TRASHEGIMISE KULTURORE MATERIALE NE SHQIPERI. 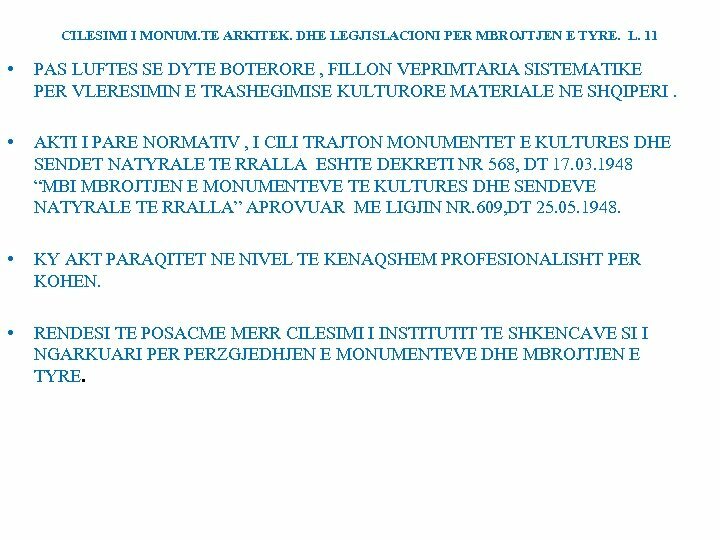 • AKTI I PARE NORMATIV , I CILI TRAJTON MONUMENTET E KULTURES DHE SENDET NATYRALE TE RRALLA ESHTE DEKRETI NR 568, DT 17. 03. 1948 “MBI MBROJTJEN E MONUMENTEVE TE KULTURES DHE SENDEVE NATYRALE TE RRALLA” APROVUAR ME LIGJIN NR. 609, DT 25. 05. 1948. • KY AKT PARAQITET NE NIVEL TE KENAQSHEM PROFESIONALISHT PER KOHEN. 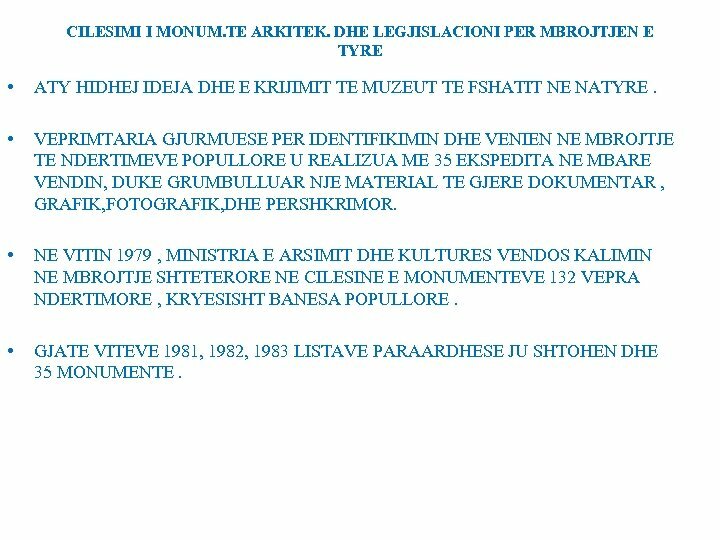 • RENDESI TE POSACME MERR CILESIMI I INSTITUTIT TE SHKENCAVE SI I NGARKUARI PERZGJEDHJEN E MONUMENTEVE DHE MBROJTJEN E TYRE. CILESIMI I MONUM. TE ARKITEK. DHE LEGJISLACIONI PER MBROJTJEN E TYRE. 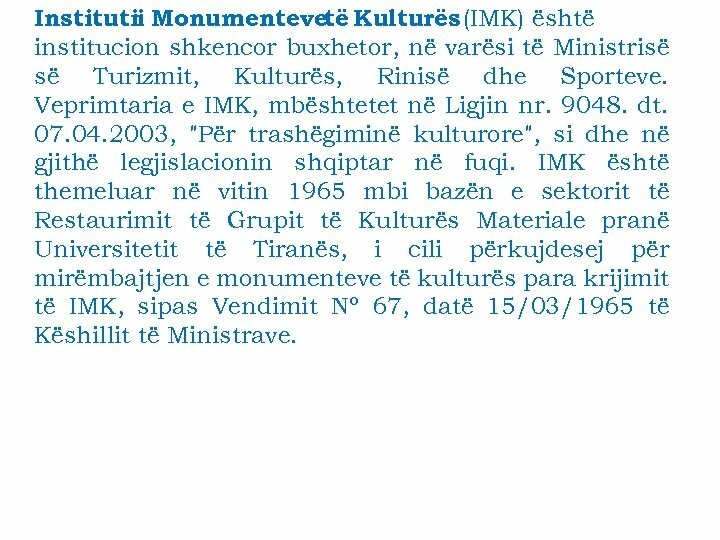 L. 10 • KRIJIMI I I. M. K. NE VITIN 1965, HAPI HORIZONTE TE REJA NE FUSHEN E VLERESIMIT TE TRASHEGIMISE SE KULTURES MATERIALE. • NE KETO RRETHANA ME 23. 9. 1971 MIRATOHET DEKRETI “ MBI MBROJTJEN E MONUMENTEVE KULTURORE E HISTORIKE DHE PASURIVE NATYRALE TE RRALLA”. 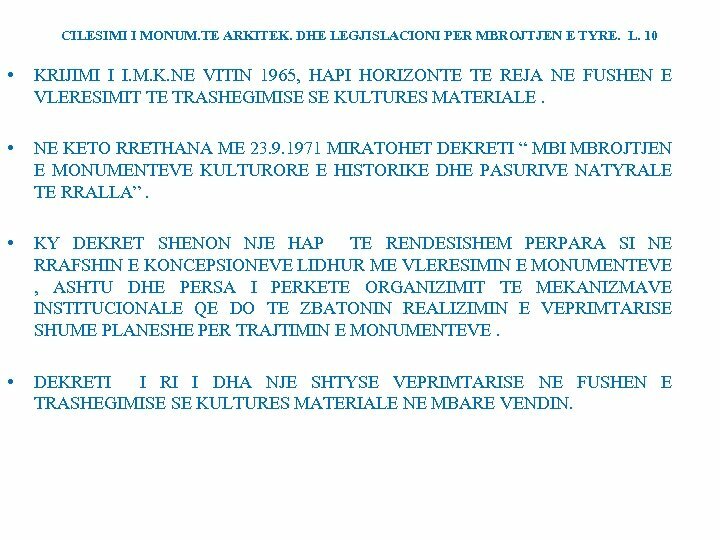 • KY DEKRET SHENON NJE HAP TE RENDESISHEM PERPARA SI NE RRAFSHIN E KONCEPSIONEVE LIDHUR ME VLERESIMIN E MONUMENTEVE , ASHTU DHE PERSA I PERKETE ORGANIZIMIT TE MEKANIZMAVE INSTITUCIONALE QE DO TE ZBATONIN REALIZIMIN E VEPRIMTARISE SHUME PLANESHE PER TRAJTIMIN E MONUMENTEVE. • DEKRETI I RI I DHA NJE SHTYSE VEPRIMTARISE NE FUSHEN E TRASHEGIMISE SE KULTURES MATERIALE NE MBARE VENDIN. CILESIMI I MONUM. TE ARKITEK. DHE LEGJISLACIONI PER MBROJTJEN E TYRE. L. 10 • MBI BAZEN E KETIJ DEKRETI MINISTRIA E ARSIMIT DHE KULTURES , ME 1. 6. 1972, MIRATOI RREGULLOREN “PER MBROJTJEN E MONUMENTEVE KULTURORE DHE HISTORIKE. • KY DEKRET PATI NJE SHTESE NE VITIN 1979, DUKE RREPTESUAR MASAT KARSHI SHKELSAVE TE KETIJ LEGJISLACIONI. 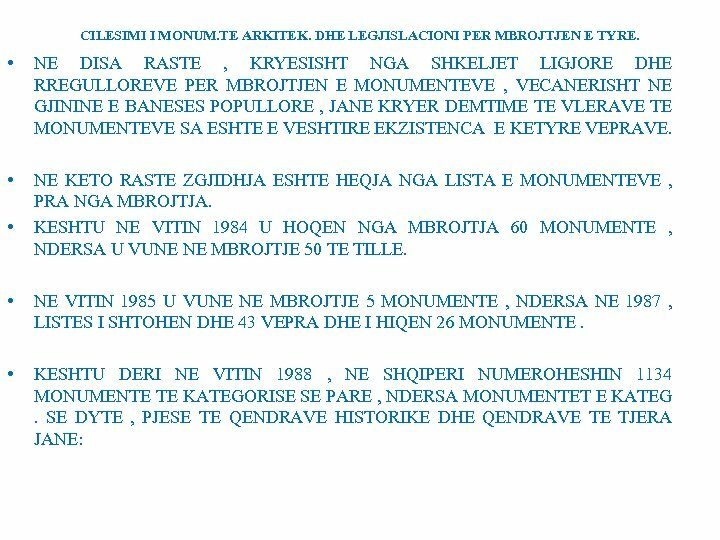 • NE VIJIM TE NDRYSHIMEVE TE LEGJISLACIONIT PER MONUMENTET, ME 26. 2. 1980 DOLI RREGULLORJA , ” MBI MBROJTJEN E MONUMENTEVE KULTURORE DHE HISTORIKE DHE PASURIVE NATYRORE TE RRALLA “. • NE KETE AKT PER HERE TE PARE PERCAKTOHET GJERE DHE SAKTE TERMI “MONUMENT KULTURE”. CILESIMI I MONUM. TE ARKITEK. DHE LEGJISLACIONI PER MBROJTJEN E TYRE. • PAS NDRYSHIMEVE THELBESORE POLITIKE TE VITEVE 90 , TE SHEKULLIT TE KALUAR , SHTETI NUK TREGOI NJE PERKUJDESJE TE VECANTE , SIC PRITEJ, NDAJ DETYRIMEVE TE LIGJSHME PER ATE PASURI KULTURORE TE VENE NE MBROJTJE PREJ TIJ. • VITET E FUNDIT KA NJE INTERESIM ME TE MADH NE CAKTIMIN E FONDEVE PER RESTAURIMIN E MONUMENTEVE TE KULTURES. 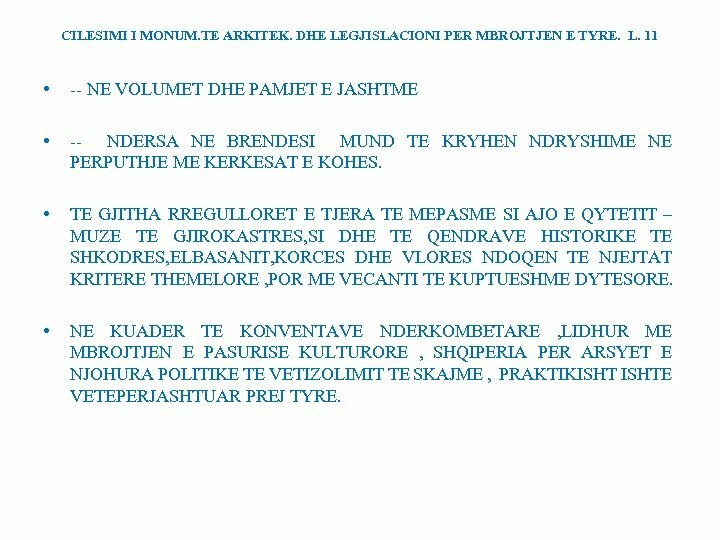 • NE VIJIM TE NDRYSHIMEVE TE LEGJISLACIONIT , PER TE PERFSHIRE NE LIGJIN PER MBROJTJEN E MONUMENTEVE SI PASURITE KULTURORE TE PALUAJTESHME ASHTU DHE ATO TE LUAJTESHME , KUVENDI POPULLOR I REPUBLIKES SE SHQIPERISE , ME 12. 10. 1994, MIRATOI LIGJIN: “PER MBROJTJEN E PASURIVE KULTURORE TE LUAJTSHME DHE TE PALUAJTSHME “. CILESIMI I MONUM. TE ARKITEK. DHE LEGJISLACIONI PER MBROJTJEN E TYRE. L. 10 • NE KETE LIGJ KEMI ZGJERIM TE SFERES SE TRASHEGIMISE KULTURORE , DUKE ZEVENDESUAR TERMIN “ MONUMENT KULTURE “ NE “ PASURI KULTURORE “ , E CILA ESHTE NE PERPUTHJE ME KONCEPTIN E PERPARUAR BASHKEKOHOR. • • TE REJAT E KETIJ LIGJI JANE : 1 -- SHFAQEN PERPJEKJET E PARA LEGJISLATIVE PER TE HEQUR TE DREJTEN PERJASHTIMORE TE SHTETIT PER TE KRYER GERMIME DHE RESTAURIME. KETO NDERHYRJE MUND TE KRYHEN EDHE PREJ PERSONASH JURIDIKE TE KUALIFIKUAR ME AUTORIZIMIN E M. K. R. S. • 2 – GJITHASHTU NE MONUMENTE , LEJOHET TE KRYHEN GERMIME DHE RESTAURIME NE BASHKEPUNIM ME INSTITUCIONE TE HUAJA TE SPECIALIZUARA. • 3 – LEJOHET FINANCIMI I KETYRE VEPRIMTARIVE EDHE ME DONACIONE PREJ FONDACIONESH ORGANIZATASH , APO INSTITUCIONESH TE HUAJA SHTETERORE DHE PRIVATE. CILESIMI I MONUM. TE ARKITEK. DHE LEGJISLACIONI PER MBROJTJEN E TYRE. 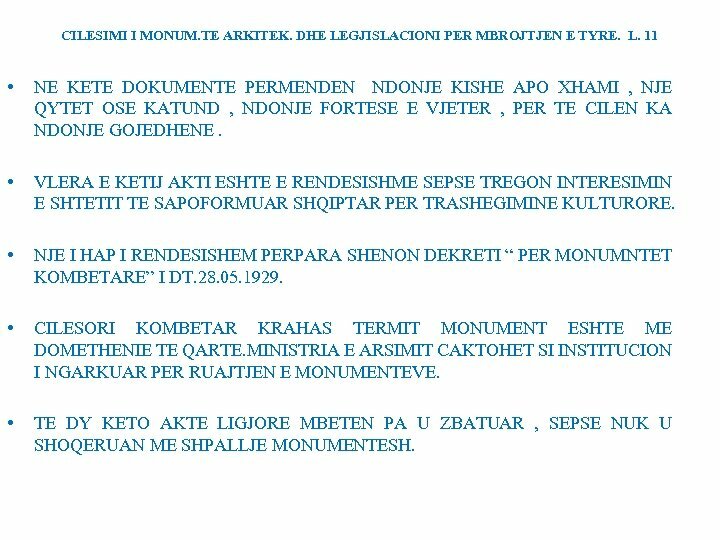 L. 11 • KEMI TRAJTUAR LEGJISLACIONIN PER MBROJTJEN E MONUMENTEVE NE SHQIPERI , POR DUHET TE KEMI NE KONSIDERATE EDHE RREGULLORET E NDRYSHME ME KARAKTER ADMINISTRATIVO- SHKENCOR PER TRAJTIMIN E PASURISE SONE KULTURORE. • NE RRADHE TE PARE VINE NE DUKJE RREGULLORET PER MBROJTJEN E QENDRAVE HISTORIKE. • NDER TO E NJE RENDESIE PARESORE ESHTE DOKUMENTI “ RREGULLORE MBI ADMINISTRIMIN E QYTETIT – MUZE TE BERATT “ , I SE NJEJTES DT. ME VENDIMIN E KESHILLIT TE MINISTRAVE PER VENIEN NE MBROJTJE SHTETERORE TE QYTETEVE – MUZE TE BERATIT DHE GJIROKASTRES, PJESES SE VJETER DHE NENTOKES SE QYTETIT TE DURRESIT, SI DHE TE PAZARIT TE VJETER TE QYTETIT TE KRUJES. CILESIMI I MONUM. TE ARKITEK. DHE LEGJISLACIONI PER MBROJTJEN E TYRE. • RREGULLORJA E MESIPERME ESHTE E NJE RENDESIE TE VECANTE PER TE ARDHMEN E MONUMENTEVE NE SHQIPERI , SEPSE AJO PERCAKTON KRAHASIMISHT HERET , DREJTIMET KRYESORE NE TRAJTIMIN E MONUM. TE ARKITEKTURES, INDIVIDUALISHT APO NE BASHKESI. 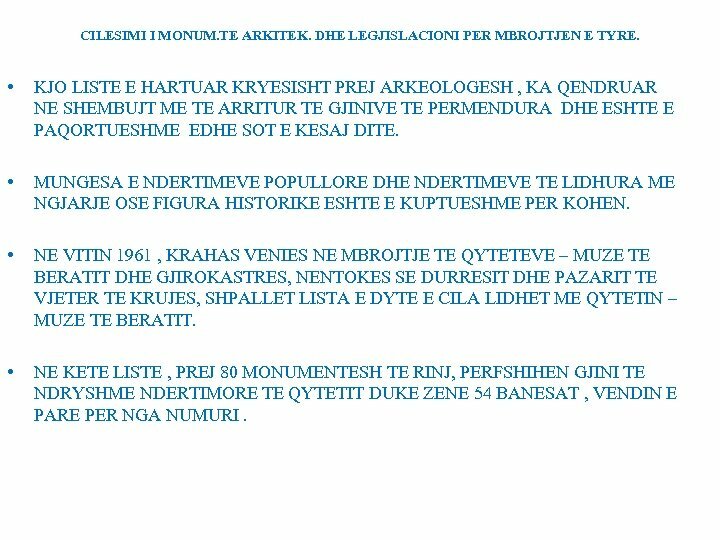 • ZONIFIKIMI I QYTETIT – MUZE TE BERATIT NE ZONE - MUZE, ZONE TE MBROJTUR DHE TE LIRE , SI DHE NDARJA E MONUMENTEVE NE KETO ZONA NE DY KATEGORI , PERKATESISHT TE KATEGORISE SE PARE DHE TE DYTE , ESHTE NJE NDIHMESE THEMELORE PER TE ARDHMEN E MONUMEN. TE GJINISE SE NDERTIMEVE POPULLORE. 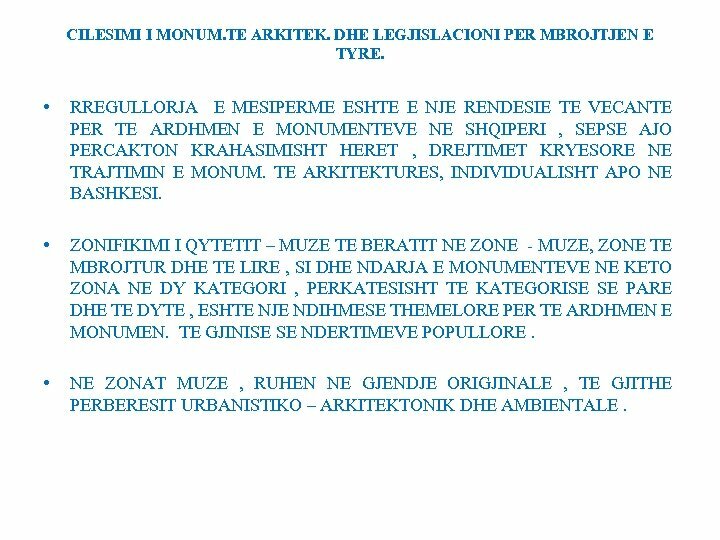 • NE ZONAT MUZE , RUHEN NE GJENDJE ORIGJINALE , TE GJITHE PERBERESIT URBANISTIKO – ARKITEKTONIK DHE AMBIENTALE. CILESIMI I MONUM. TE ARKITEK. DHE LEGJISLACIONI PER MBROJTJEN E TYRE. L. 11 • -- NE VOLUMET DHE PAMJET E JASHTME • -- NDERSA NE BRENDESI MUND TE KRYHEN NDRYSHIME NE PERPUTHJE ME KERKESAT E KOHES. • TE GJITHA RREGULLORET E TJERA TE MEPASME SI AJO E QYTETIT – MUZE TE GJIROKASTRES, SI DHE TE QENDRAVE HISTORIKE TE SHKODRES, ELBASANIT, KORCES DHE VLORES NDOQEN TE NJEJTAT KRITERE THEMELORE , POR ME VECANTI TE KUPTUESHME DYTESORE. • NE KUADER TE KONVENTAVE NDERKOMBETARE , LIDHUR ME MBROJTJEN E PASURISE KULTURORE , SHQIPERIA PER ARSYET E NJOHURA POLITIKE TE VETIZOLIMIT TE SKAJME , PRAKTIKISHTE VETEPERJASHTUAR PREJ TYRE. CILESIMI I MONUM. TE ARKITEK. DHE LEGJISLACIONI PER MBROJTJEN E TYRE. • I VETMI RAST I PERFSHIRJES NE KETO KONVENTA ESHTE ADERIMI I REPUBLIKES POPULLORE TE SHQIPERISE NE KONVENTEN : • “ MBI MBROJTJEN E VLERAVE KULTURORE NE RAST KONFLIKTI TE ARMATOSUR “ , ADAPTUAR NGA KONFERENCA E UNESKO-S, HAGE 14. 5. 1954. • KUADRI LIGJOR I MBROJTJES SE MONUMENTEVE NE SHQIPERI , MEGJITHESE I HERSHEM , ESHTE BERE VEPRUES VETEM PAS LUFTES SE II BOTERORE. • AI KA PERVEHTESUAR ARRITJET E VENDEVE ME TRADIATA TE HERSHME NE FUSHEN E VLERESIMIT TE MONUMENTEVE. 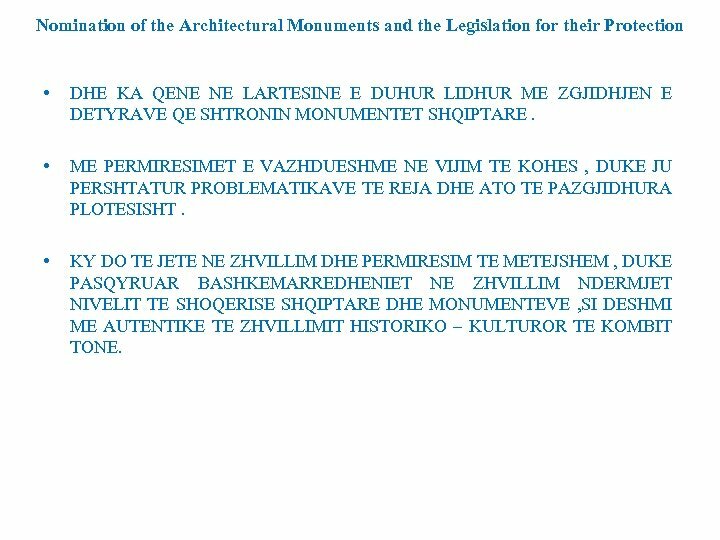 Nomination of the Architectural Monuments and the Legislation for their Protection • DHE KA QENE NE LARTESINE E DUHUR LIDHUR ME ZGJIDHJEN E DETYRAVE QE SHTRONIN MONUMENTET SHQIPTARE. • ME PERMIRESIMET E VAZHDUESHME NE VIJIM TE KOHES , DUKE JU PERSHTATUR PROBLEMATIKAVE TE REJA DHE ATO TE PAZGJIDHURA PLOTESISHT. • KY DO TE JETE NE ZHVILLIM DHE PERMIRESIM TE METEJSHEM , DUKE PASQYRUAR BASHKEMARREDHENIET NE ZHVILLIM NDERMJET NIVELIT TE SHOQERISE SHQIPTARE DHE MONUMENTEVE , SI DESHMI ME AUTENTIKE TE ZHVILLIMIT HISTORIKO – KULTUROR TE KOMBIT TONE.